Walking opportunities have been a little restricted for the past couple of weeks, there was a hiccup in the good weather during the week following our last walk when we had a couple of very noisy thunderstorms and some cloudy and cooler days. 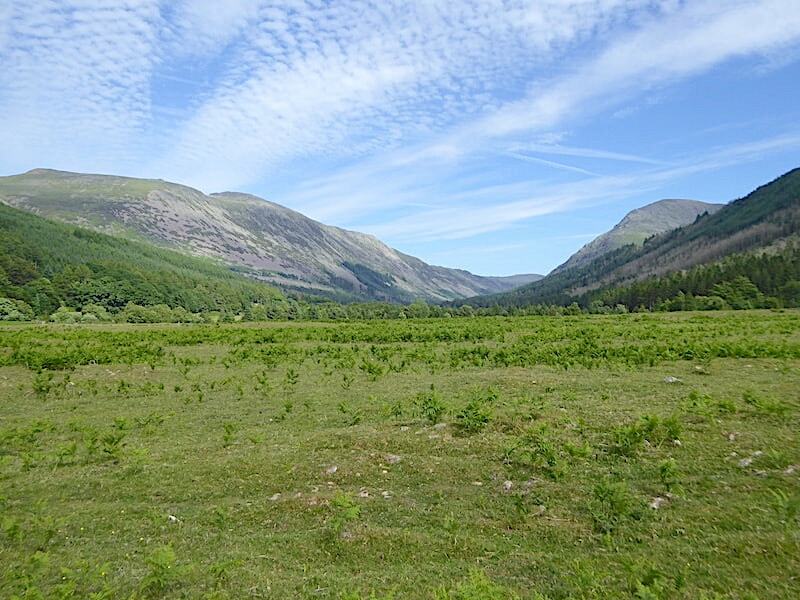 That did at least give us the chance to deal with all the house, garden and paperwork chores which had been consigned to the metaphorical pending tray while we were out gallivanting over the fells enjoying all the good weather. This last week we have also needed to stay at home, this time for routine stuff, the chimney having its annual sweep, the boiler having its annual service, J’s car in for its M.O.T and a couple of replacement parts, the bill for which will no doubt bring tears to our eyes when we collect it at the weekend. 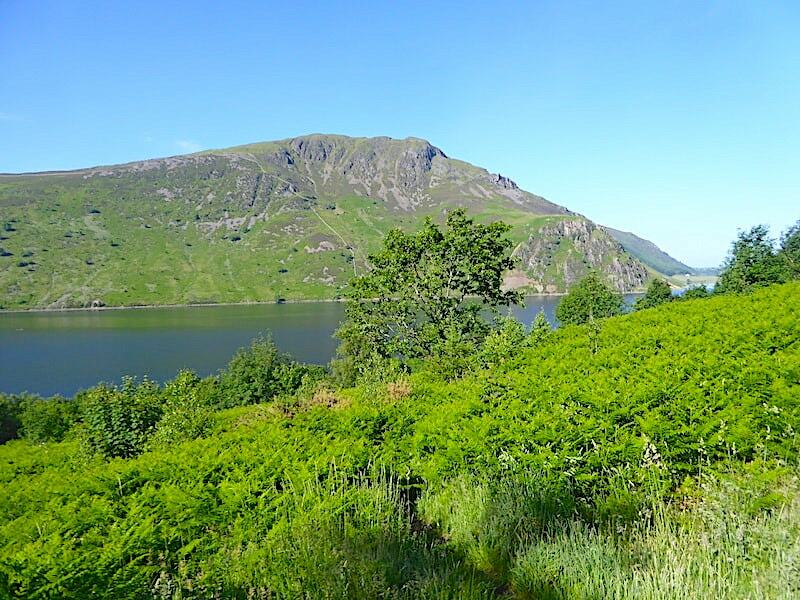 Today’s forecast was good and, having resolved to get on with walking some of the neglected fells, we stuck to our resolution, piled into my little red car and off we went back to Ennerdale for a walk up to Steeple and three of its neighbours. The forecast didn’t let us down and we enjoyed warm, sunny weather from start to finish. We were up and about very early this morning, I’m doing the driving today and I wanted to get the longish drive done with before the work and school traffic started appearing. We also wanted to be well on our way up to Steeple before the day’s heat started to build. 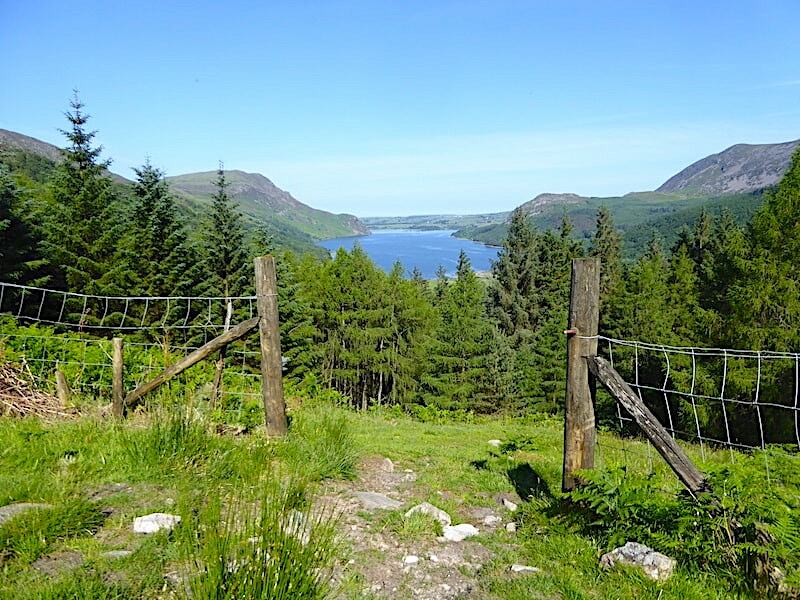 It was a beautiful sunny morning, but still pleasantly cool, and the walk alongside Ennerdale Water to Irish Bridge seemed to take hardly any time at all. 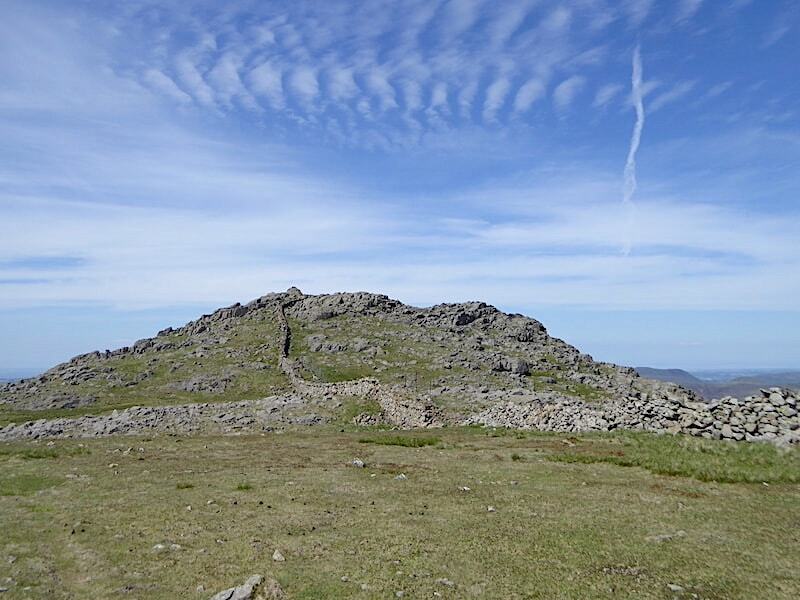 As we emerged from the car park onto the shoreside track we had this view of Crag Fell clearly defined against the cloudless sky. 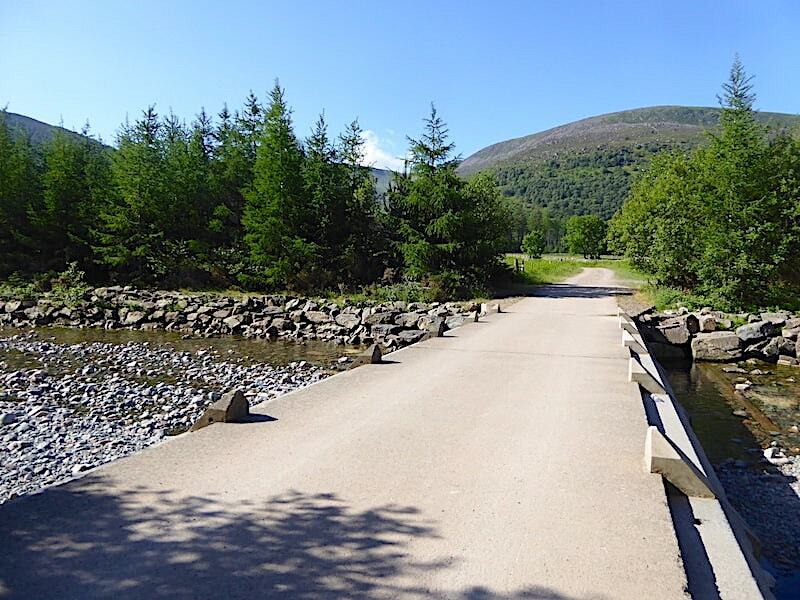 Irish Bridge dazzles our eyes as the bright morning sunlight bounces off its concrete surface, and once across it …..
….. we walk along the walled lane at the head of Ennerdale Water. 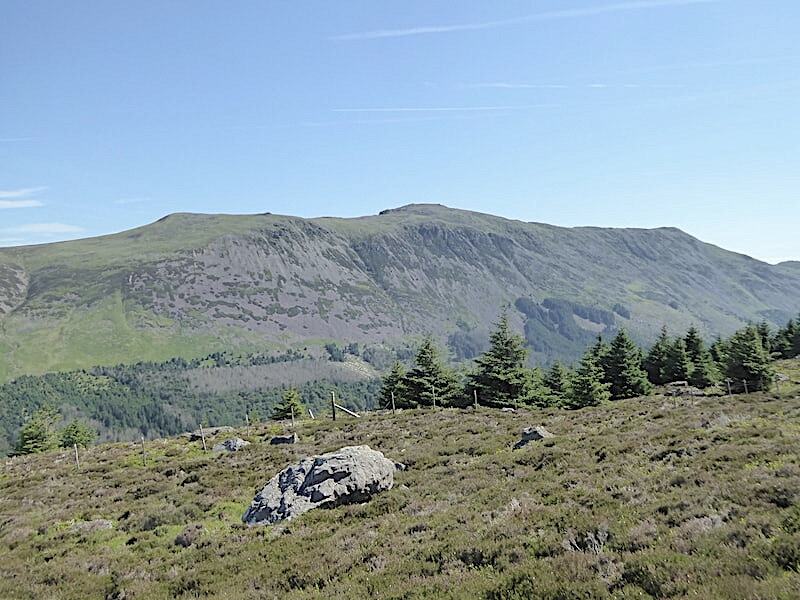 On the right skyline we can see three of the fells on today’s walk route, the flattish mound of Caw Fell to the right, then the rocky bump of Little Gowder Crag next to which just a smidgeon of Haycock can be seen. 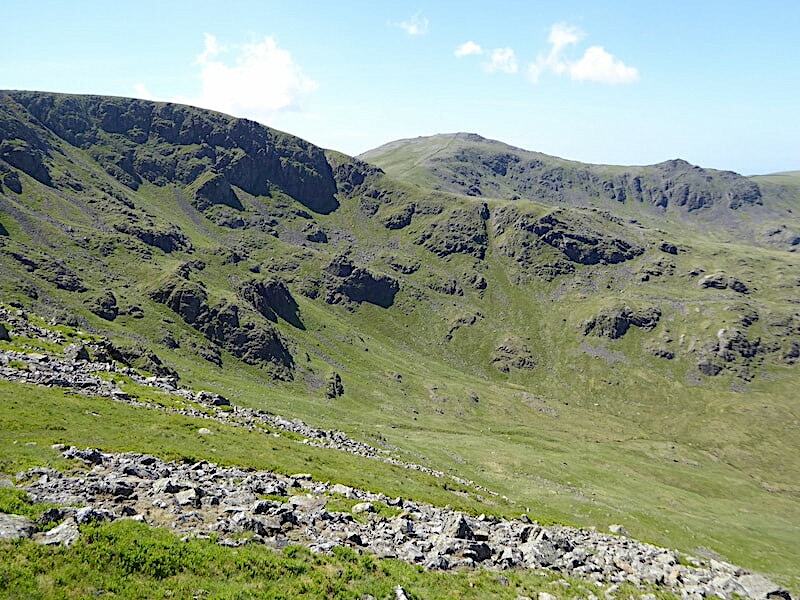 However, we’ll reach them towards the end of today’s walk, to begin with we will be walking up Lingmell, the tree covered hill on the left of the shot, beyond which we will start the climb up the north ridge of Steeple. 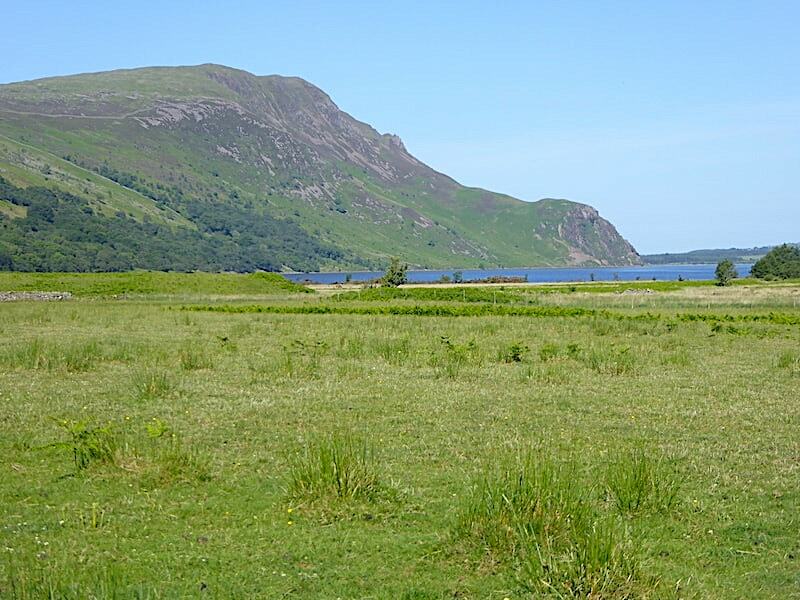 Crag Fell and Angler’s Crag above Ennerdale Water from the walled lane. 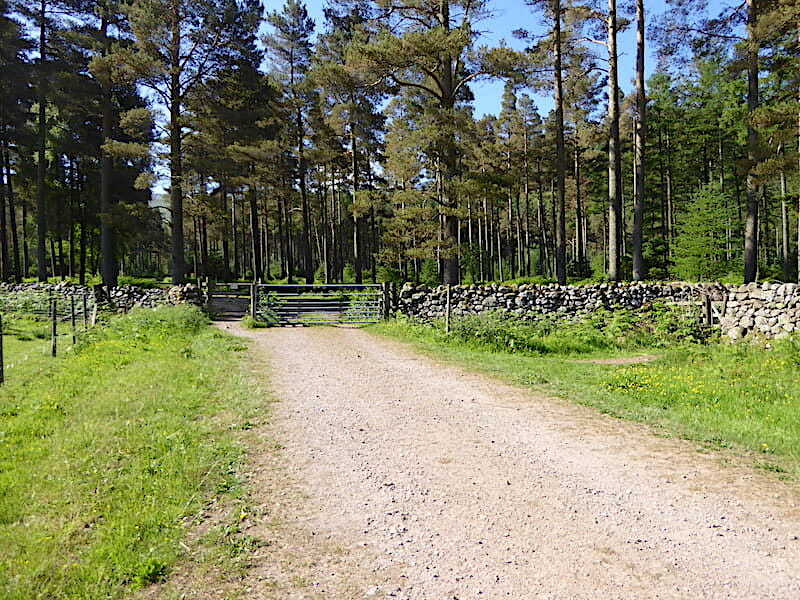 At the end of the lane we go through the gate, next to a cattle grid …..
….. and into the very welcome shade of the Scots Pines. We take the left hand track and will return to this point via the right hand track in a good few hours from now, no doubt feeling a lot less sprightly than we do at the moment. 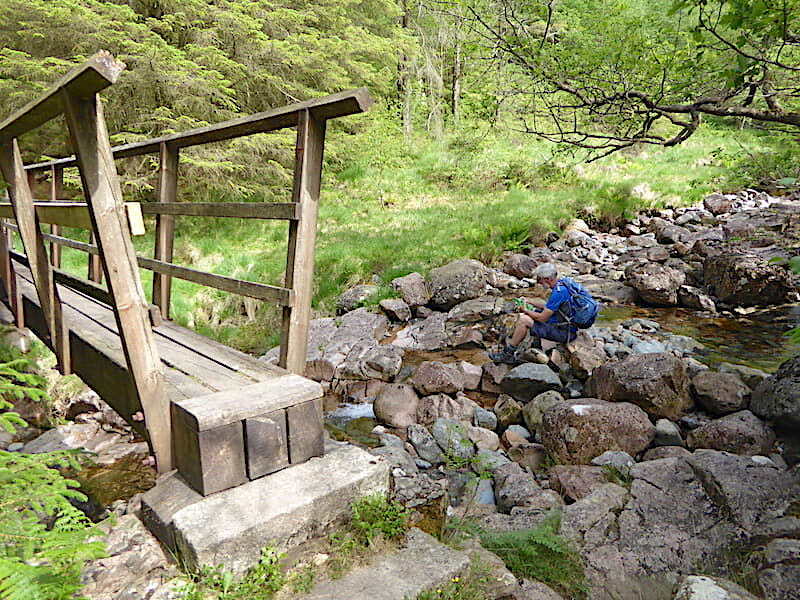 At least we are getting a gentle walk in as we follow the track around and cross Woundell Beck by this little footbridge. Across the bridge we bear left, follow the track for a couple of hundred yards or so, and just before we reach the next gate …..
….. we turn up through a gap in the trees and follow this little path leading us up Lingmell End. 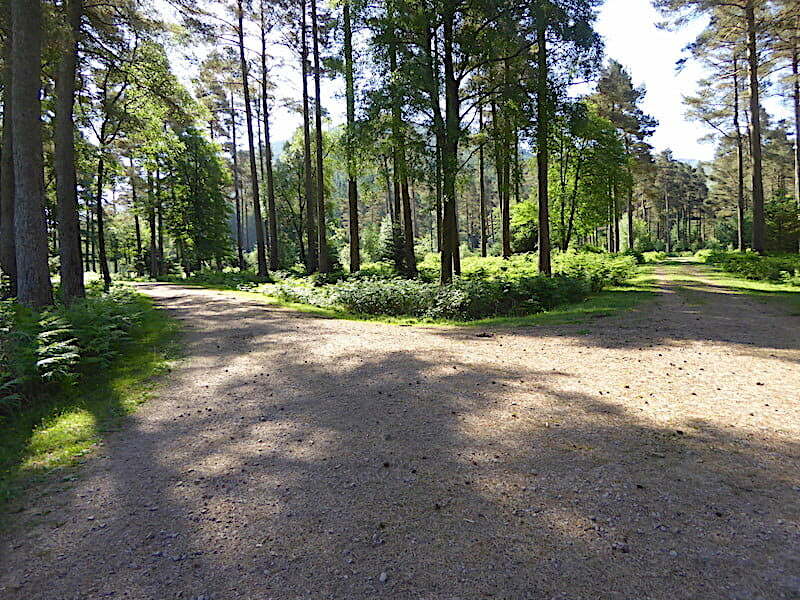 Thanks to all the dry weather we were spared the cattle created mud bath which often awaits walkers at this point. All the Galloway cattle, which have been introduced into the valley as part of a re-wilding project so they would trample down the bracken, churn up the soil, and thus allow other plants to flourish, were obviously slacking on the job and were standing, somewhat morosely we thought, in the cooling shade of the trees grazing on the lush grass. They certainly hadn’t trampled down the bracken on the other side of the valley, we came down through acres of the stuff on our way down off the Great Borne ridge a couple of weeks ago, with all the cattle once again foraging in the shade of the forest. Maybe they didn’t read their job description carefully enough, or perhaps I haven’t quite got the hang of this re-wilding concept which seems to be much in vogue these days. Let’s hope the re-wilders have thought everything through thoroughly or they might end up with a situation they hadn’t bargained for. 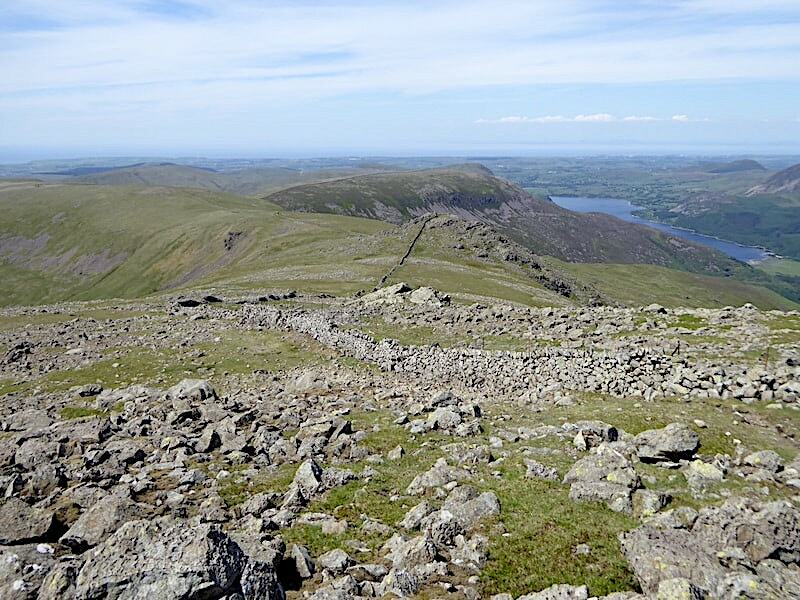 Anyway I’ve digressed as usual, so I’ll get off the soap box and get on with the walk, which means more climbing up Lingmell End over a very rough and stony path. It was lovely in the shade but the minute we were out of it we could feel the heat building rapidly. 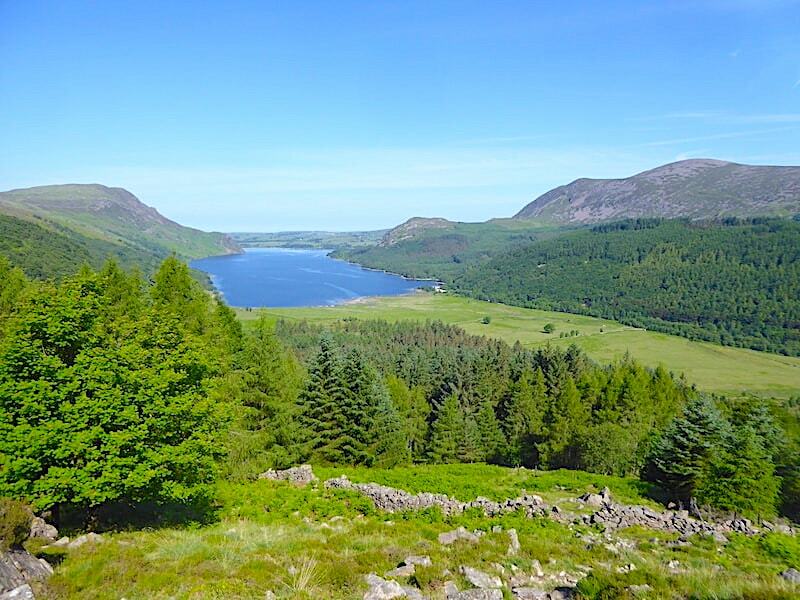 A face mopping pause beneath a shady tree gave us a chance to look back across Ennerdale at Starling Dodd and Little Dodd where we walked a couple of weeks ago. 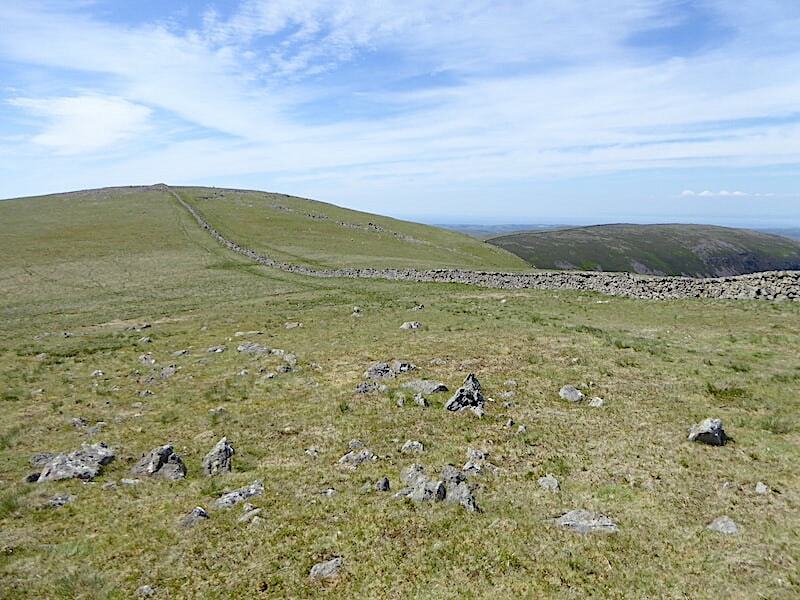 We emerge from the shade onto the open fell and immediately feel the heat again but there is a little more air circulating around us now which helps a little. 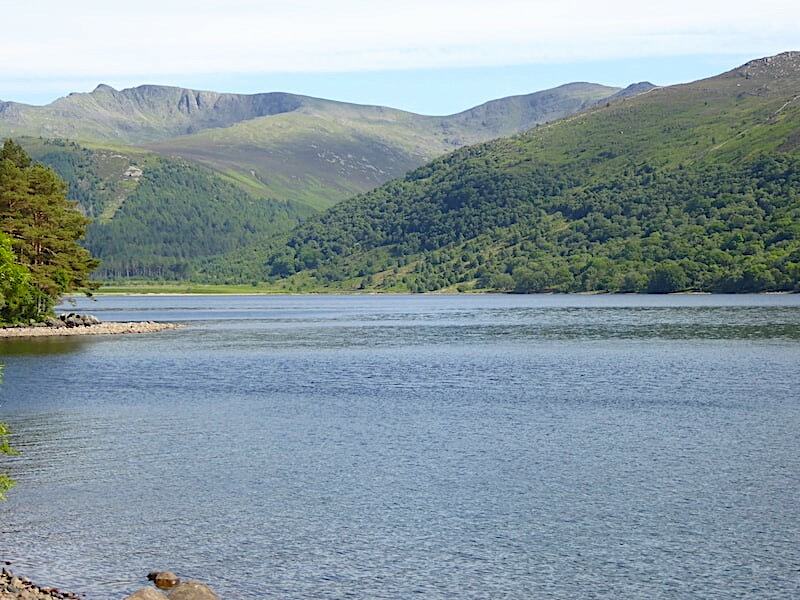 What would we give right this minute for a bucketful of Ennerdale Water to splash over ourselves? There is still more climbing to be done across the open fell and the path, now thick with heather and bilberry and swarming with midges, remains rough and stony, as it has been since we started climbing, which doesn’t make for rapid progress but we plod on …..
….. until the gradient finally eases and we reach the cairn on Lingmell, although we did have to deviate slightly from the rough track to go across to it. 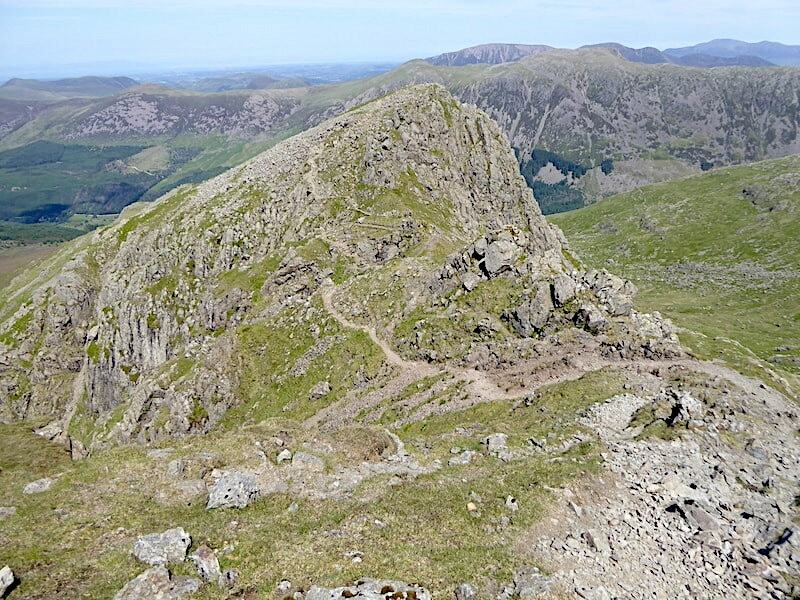 From here you get a proper look at Steeple, that’s the pointy top towards the centre skyline, and its north ridge. 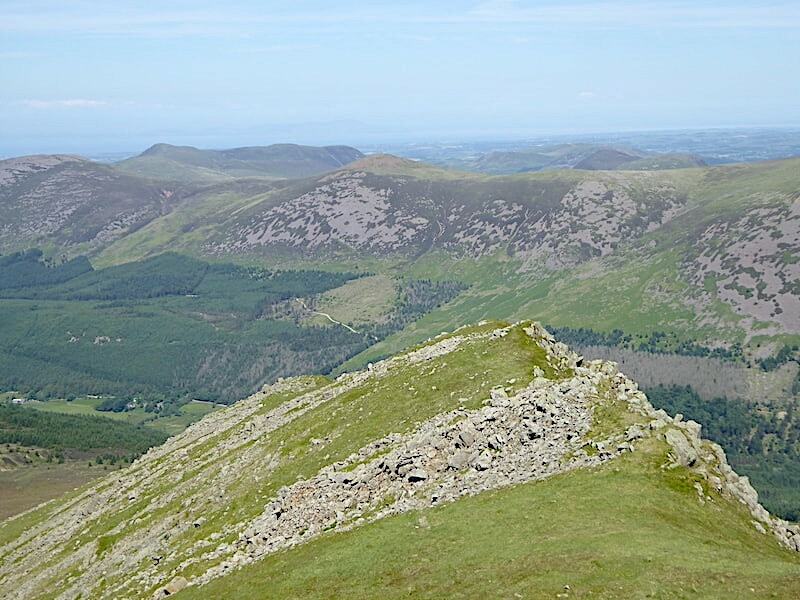 On the left is Pillar and to the right of Steeple is Scoat Fell. 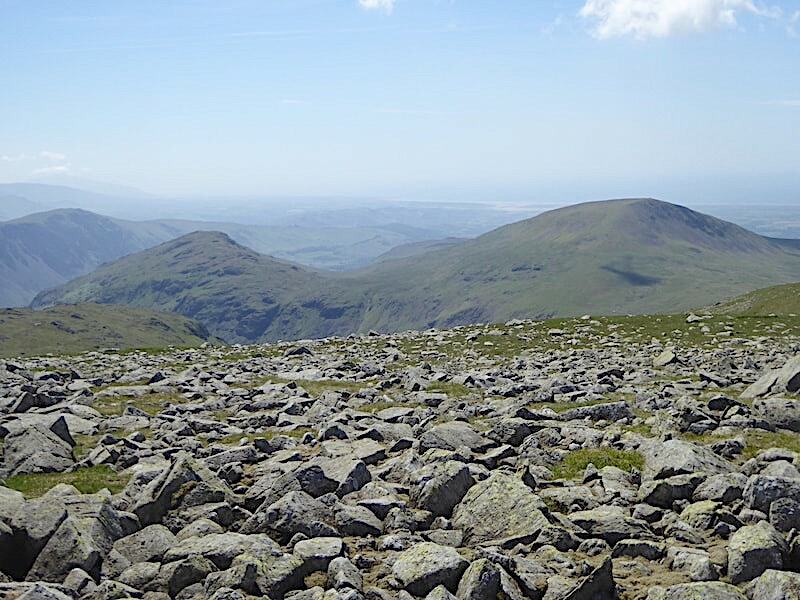 We down packs, our tops soaked with sweat and stuck to our backs, have a good mop-down and take a short drinks break at the cairn from where there is a good view of the Red Pike-High Stile-High Crag ridge across the valley. The path we’ve been following runs alongside the fence at the bottom of the shot so we didn’t have to make much of a diversion to reach the cairn. After our break we make our way back to the path which seems to get rougher and rougher as we make our way along it. The clouds of midges are everywhere and are constantly attacking J from all directions which is irritating him no end. I’m usually the one who gets bitten to pieces and ending up looking as though I’ve fallen foul of a patch of nettles. On the plus side though everything underfoot is bone dry, rough, stony and dry is a whole lot better than rough, stony and boggy. Low Beck matched its name today, the flow of water being little more than a dribble, which made for an easy crossing. There was enough of a flow for us to throw a couple of handfuls across our faces and necks and for us to have a good drink of it. 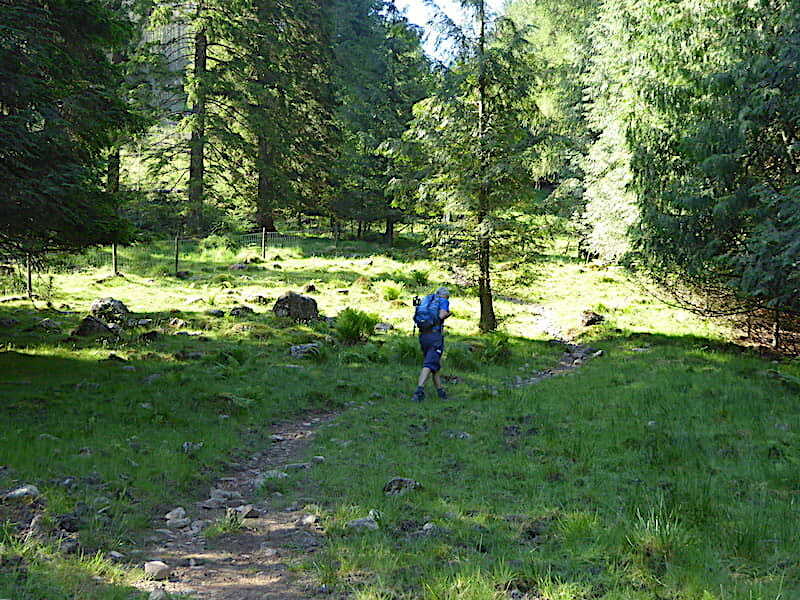 We wanted to save all the liquid we had in our packs for the rest of the walk, as there is no dependable source of water between here and our return to the valley. An image of one of those signs you see just before a petrol station, something along the lines of ‘Last water for a lot of miles’, sprang to mind. Once across the beck the walk over the north ridge begins in earnest. A look back at Lingmell now that we’ve crossed the first section of rise, below us is the little gully containing Low Beck. 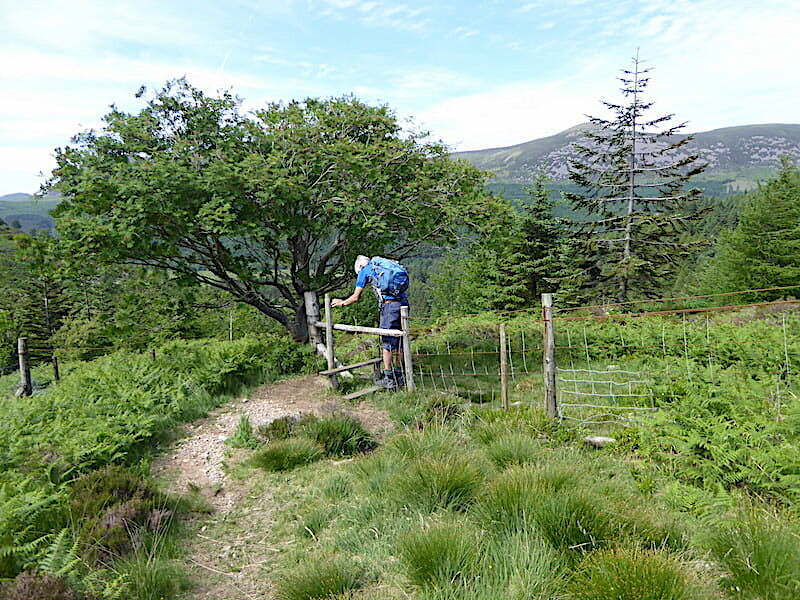 With back muscles appeased after our short break we carry on upwards, gradually the heather gives way to grass, the path becomes much less rough and stony and consequently walking over it is a little less troublesome. 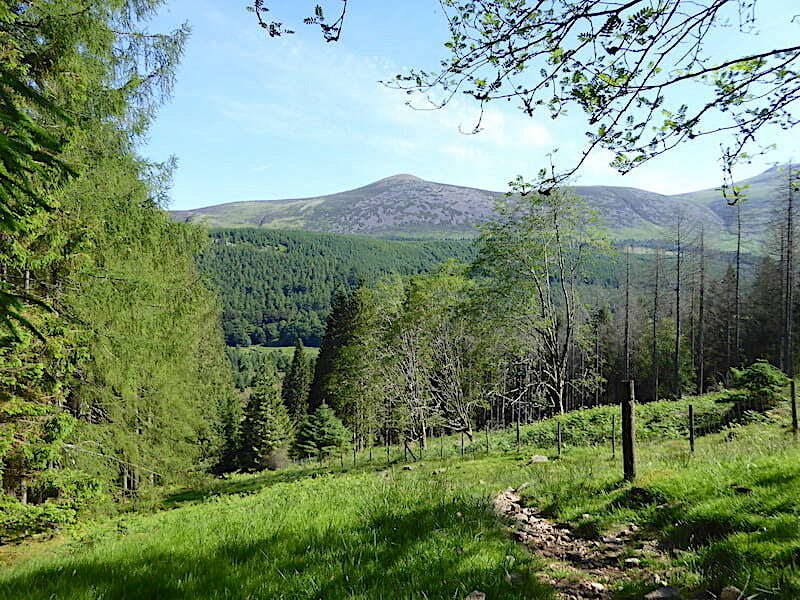 It has been so long since we walked in this area that we had almost forgotten how dramatic and imposing the landscape is, AW described it as ‘first rate mountain scenery’. 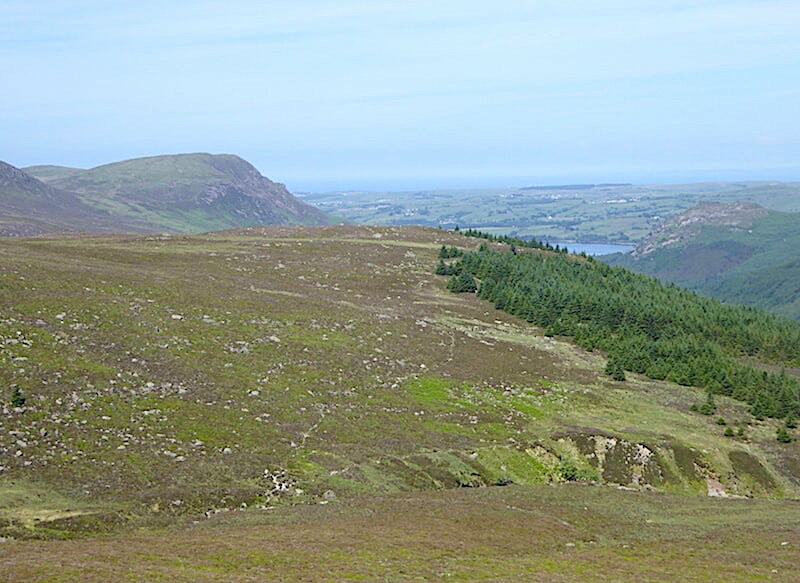 Just below the first of the rocky peaks is this fantastic view of Pillar, Wind Gap and Black Crag above Windgap Cove. Directly ahead of us lie the rocky towers of Long Crag and to the left of them is Black Crag with Mirk Cove between the two. 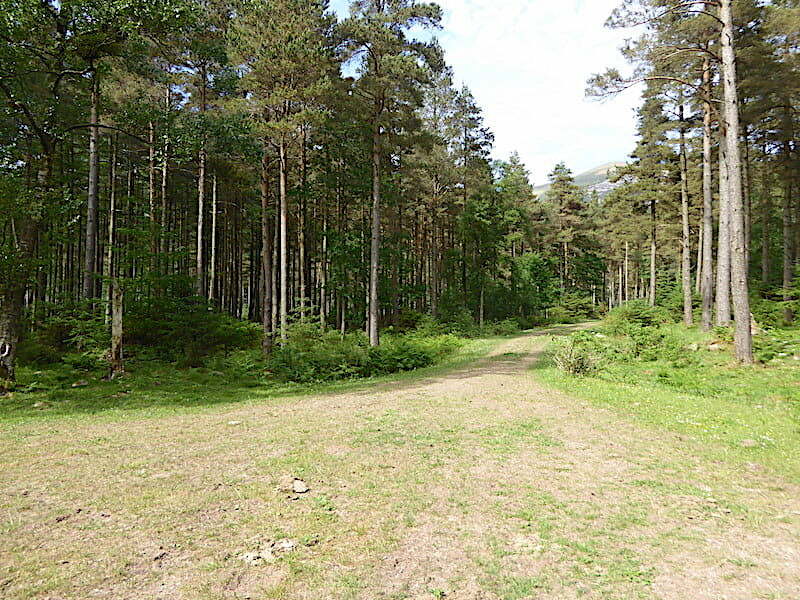 The grassy ground is much nicer to walk over but it is steep and its now very warm so we are grateful for the cooling breeze as we continue to swelter our way upwards. A flattish piece of ground makes a handy stopping point from which to view the route so far which began all the way back below the diminutive Bowness Knott, on the shore line just beyond the end of the forested area, across the mound of Lingmell and then up the various rises of Steeple’s north ridge to this point, but …..
….. we aren’t there yet, there’s this rocky tower to deal with first, phew, this is very warm work. The views across Mirkiln Cove help take one’s mind off things though, beyond some of Scoat Fell’s crags and the Tewit How ridge we have a grand view of Haycock and Little Gowder Crag. AW has the name of the cove as Mirklin Cove while the OS map calls it Mirkiln Cove, I have no idea which is correct. 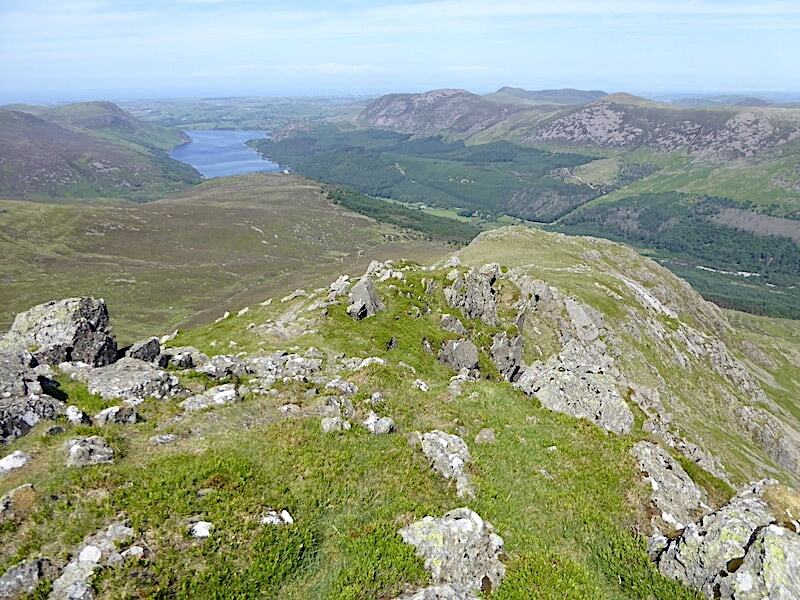 We reach the top of the rocky tower and look back to take in the spectacular view below our craggy pinnacle from where Herdus, Great Borne and Starling Dodd look like nothing more than a long, low ridge of foothills. 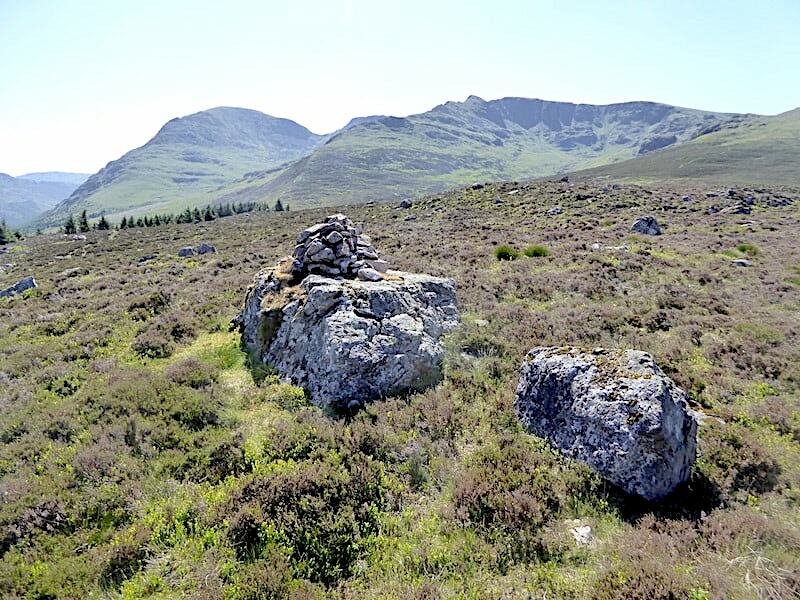 Even at this height we still haven’t reached the summit …..
….. that is still ahead of us, with two more rock towers to deal with before we reach the top. 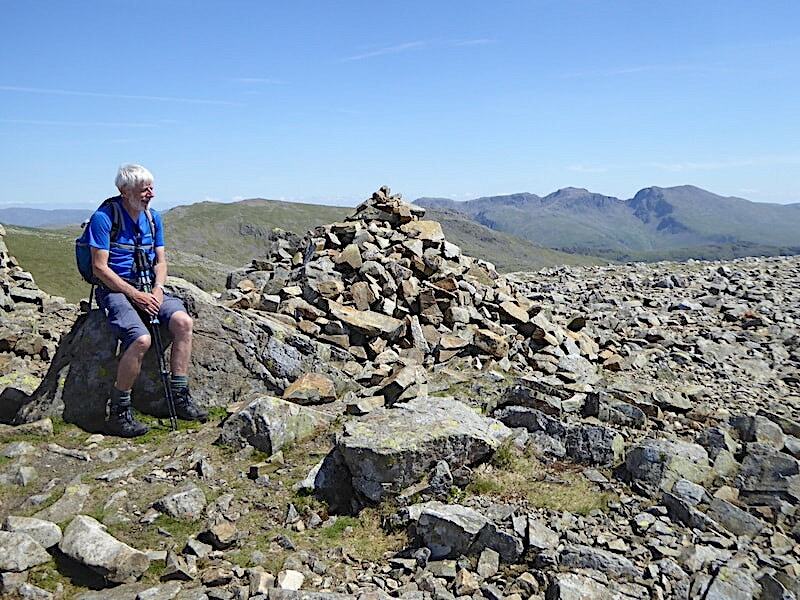 This is one of those moments when its difficult to know what to think, the summit is in sight, its a fine view but its still a little way off so a tangle of thoughts spring to mind at the spectacle before us. There’s the appreciation and enjoyment of the view, the eager anticipation of reaching the top, the consolation of knowing that the climb will soon be accomplished, all mixed in with the knowledge that its as hot as hell’s kitchen right now and that you have quite a bit more sweating to do before you reach the holy grail. Best dredge up a bit more will power from the reserve tank and get on with it then, standing around and looking at it isn’t going to get the job done, is it? 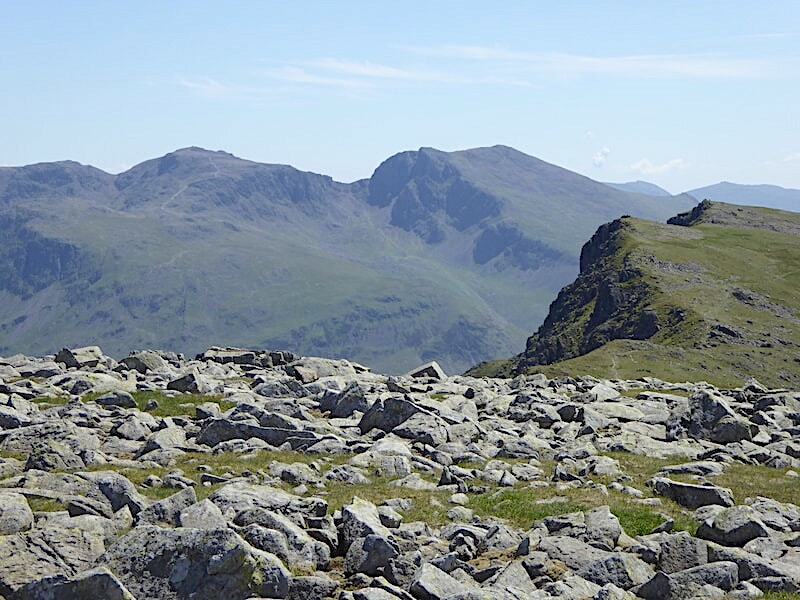 There are no difficulties to overcome, other than the heat, so I keep close to the edge, as is safe enough to do so, to peer down at the craggy pinnacles below. J refuses to even come close to the edge never mind peer over it, sticks steadfastly to the middle ground and keeps his gaze firmly on the route ahead of him. Mirk Cove is just that bit too precipitous for his liking. 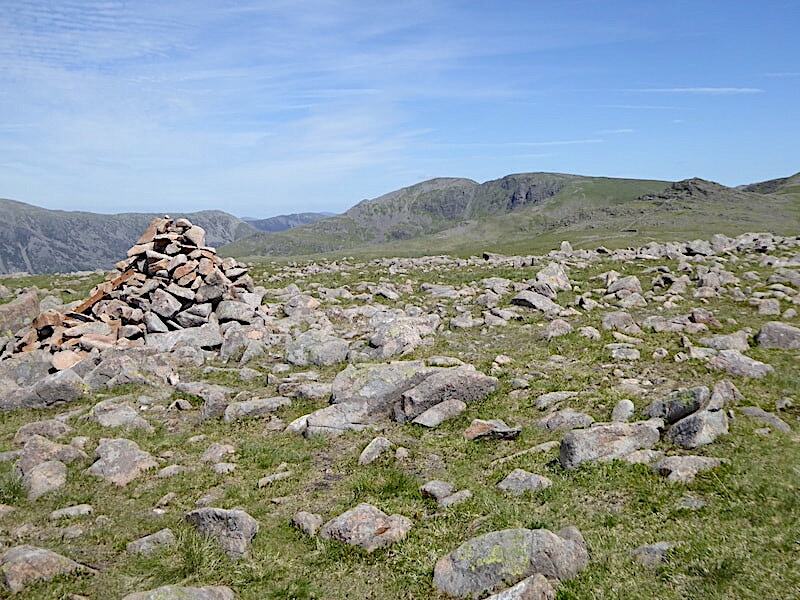 The final rock tower presents no problems either, despite the fearsome appearance of its jagged eastern crags, and the summit cairn is tantalisingly close now. 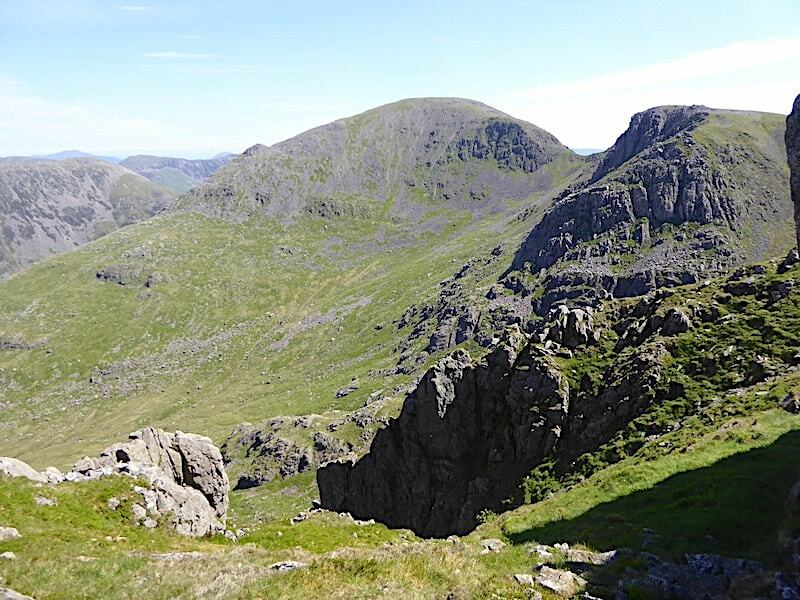 More rocky pinnacles to peer down into, the precipitous rugged shoulder of Black Crag to gawp at, and the huge presence of Pillar presiding, like a stern but stately family matriarch, over all her neighbouring family. My thoughts went straight back to 8th June 2008, ten years ago almost to the day, in weather just as hot as today, when we last stood on Pillar. Lots of little cameos bubbled up from my memories of that day, particularly when I recalled us making our way down to Wind Gap and we met a very hot and weary group of chaps coming up. I wondered where they were now and what they were doing right at this moment, I’d bet that all of them will remember that particularly arduous trudge up to the summit. I remembered something else too, the cropped trousers I was wearing on that day are the same ones I’m wearing today although in the intervening years they have been cropped even further and are still in good condition and going strong as a pair of shorts. How’s that for an example of Yorkshire parsimony? 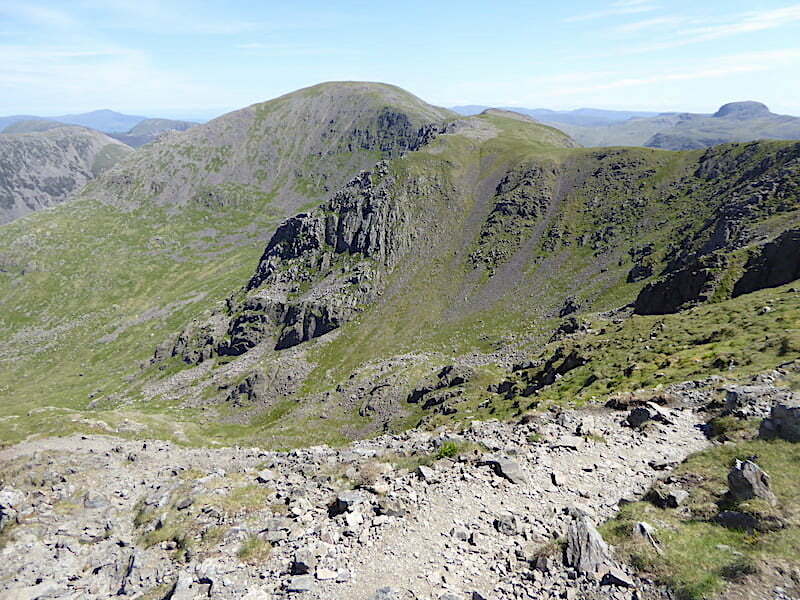 We cross the final grassy slope and take a look back at the High Stile ridge with Grasmoor, Skiddaw and Blencathra just visible on the distant skyline. Finally we reach the summit and the gps informs us that from the car park to the summit we have walked 4.87 miles and reached a height of 2687′, with our watches telling us that it has taken us three and a half hours to do so, that does include a fair number of brow mopping, rest and photography stops of course. 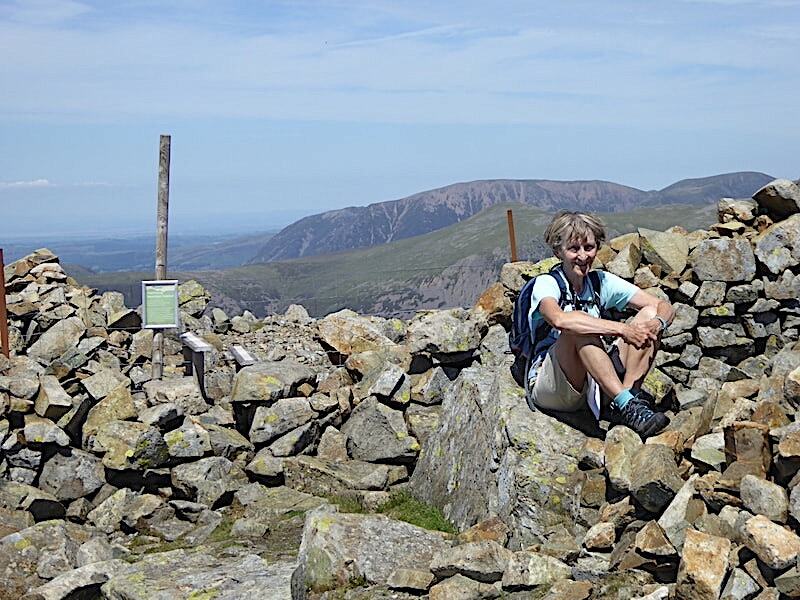 Its a marvellous place to be, especially on such a hot day, standing aloft on the relatively tiny summit area with a gentle, refreshing breeze drifting this way and that and nothing but open space all around us. 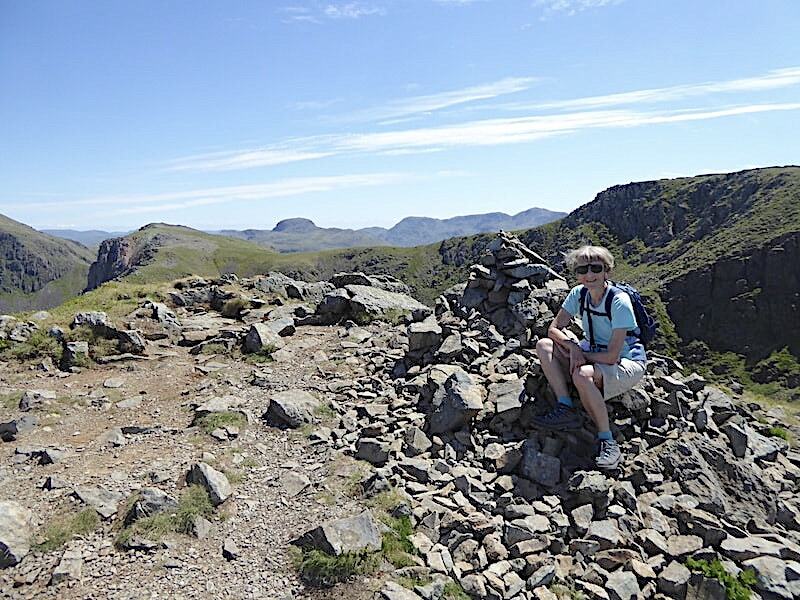 Steeple may only be an extension of Scoat Fell but it definitely feels like a separate entity and where, just for a few minutes, you can easily feel like the king or queen of your own personal castle. 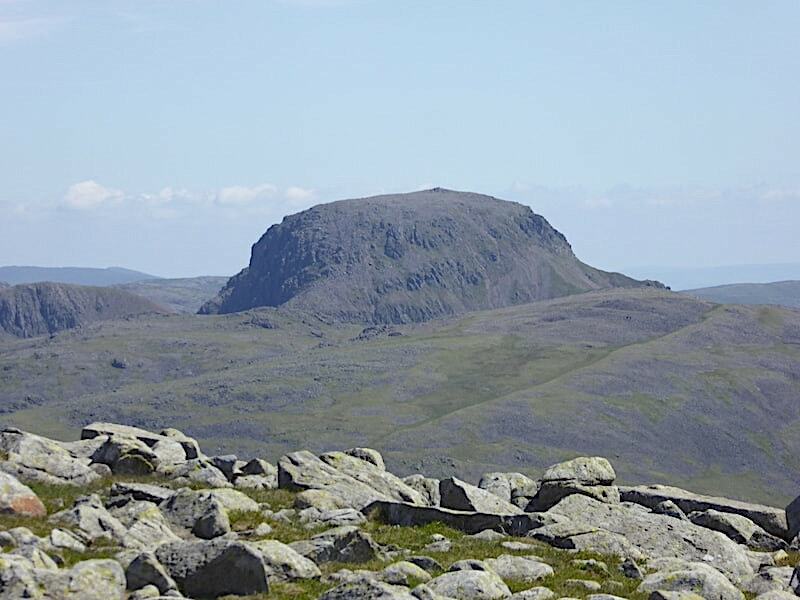 Even the closest neighbours are some distance away, with Black Crag at arm’s length across the steep sides of Mirk Cove, while Great Gable and the Scafells could almost be thought of as living a few miles up the road, so to speak. 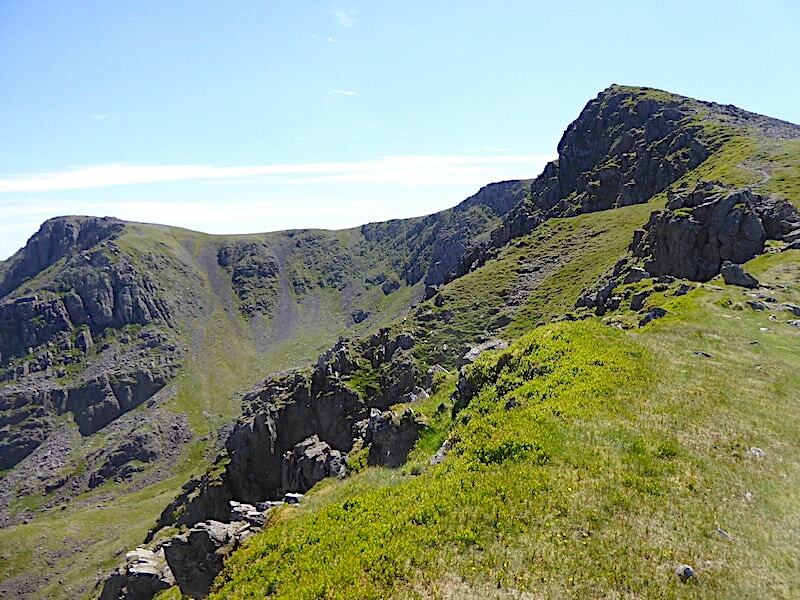 The presence of Scoat Fell does rather inhibit views to the south but it also affords a view of the route across the arete between it and Steeple which we will be crossing to continue with the rest of our walk. 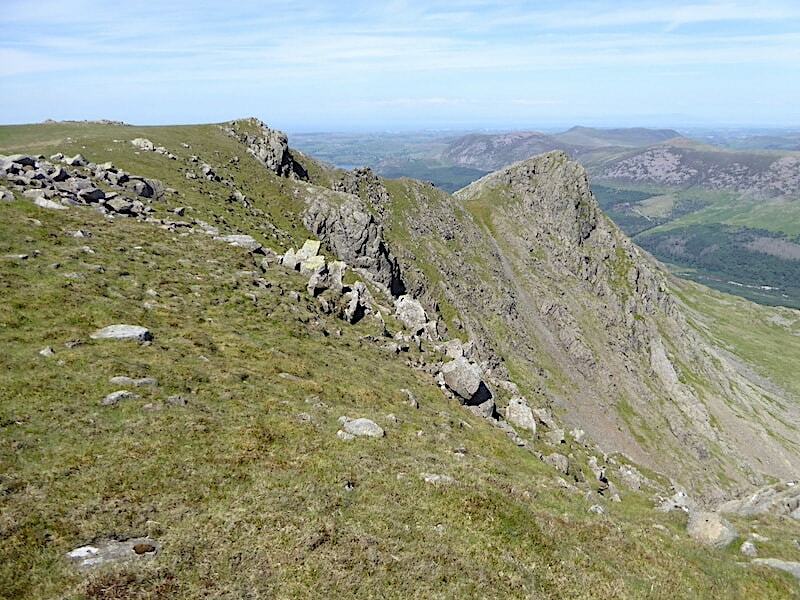 A view of the arete from Steeple’s summit as we take a breather for a minute or three. It looks worse than it actually is once you’re walking across it. 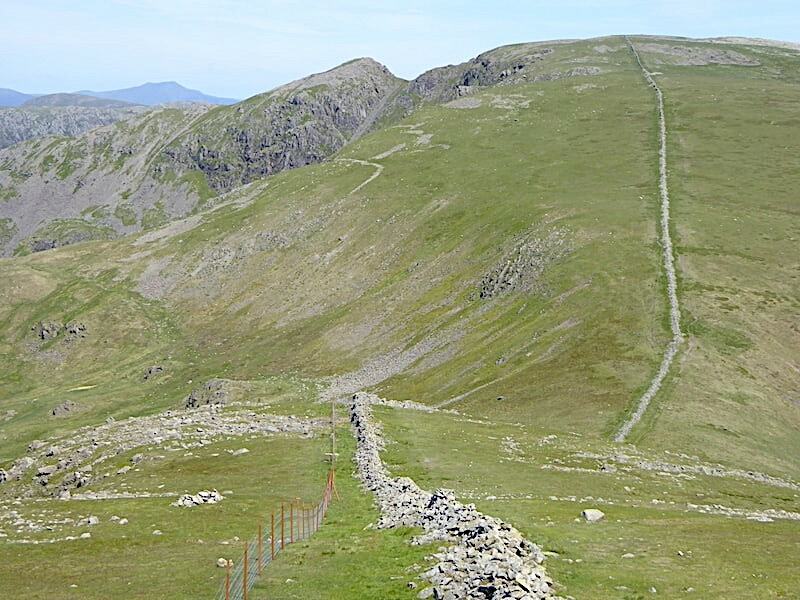 Some walkers can be seen at the top of the path on the Scoat Fell side beginning the short walk across but you might need to zoom in a little to see them. Me, in the re-cycled shorts I mentioned earlier, now well over ten years old and still nothing wrong with them, enjoying the rest and the mid-day sun, ‘mad dogs and Englishmen’ springs to mind. This was weird. 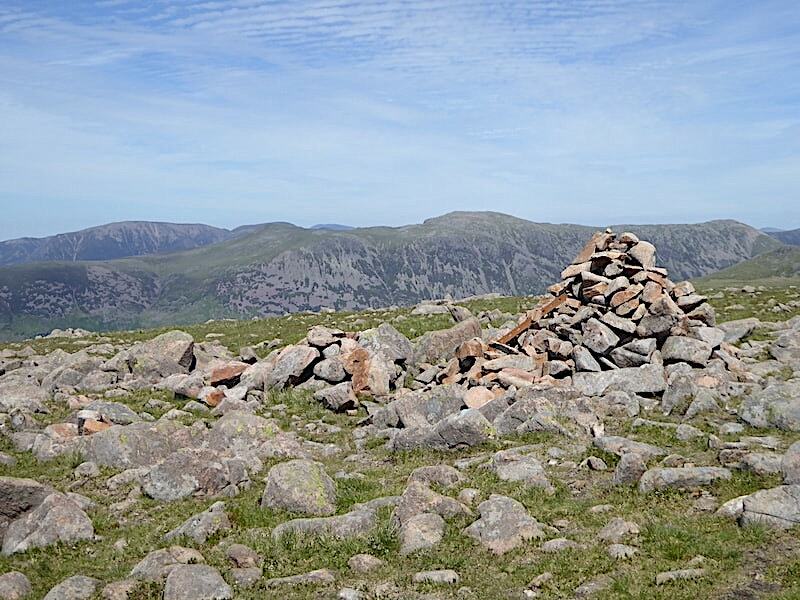 There I was, sitting by the cairn minding my own business and just gazing around when I noticed this strange sight high up in the sky across and beyond Ennerdale. 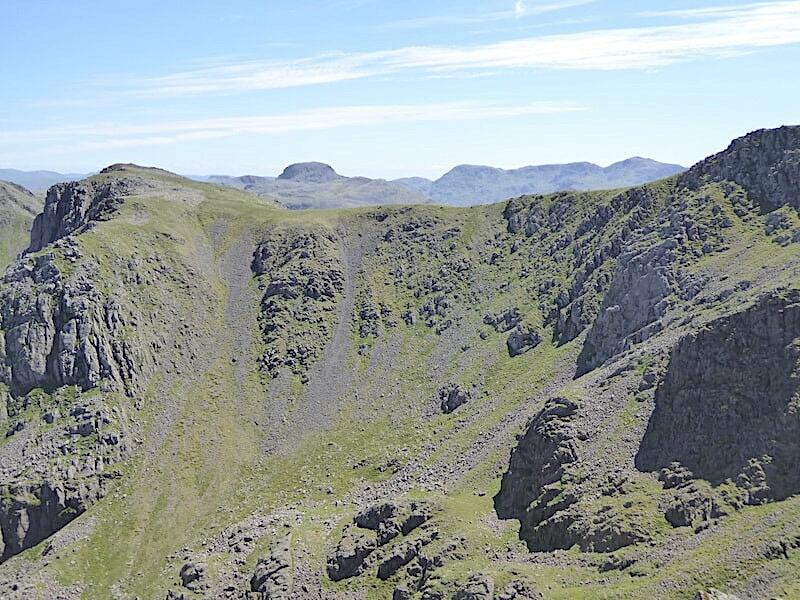 At first glance I thought they were fell tops but immediately realised that they were much, much higher than any of the fell tops across there. Substantial shapes arising above the cirrus cloud strata with absolutely nothing to be seen below them, other than more layers of cirrus cloud. 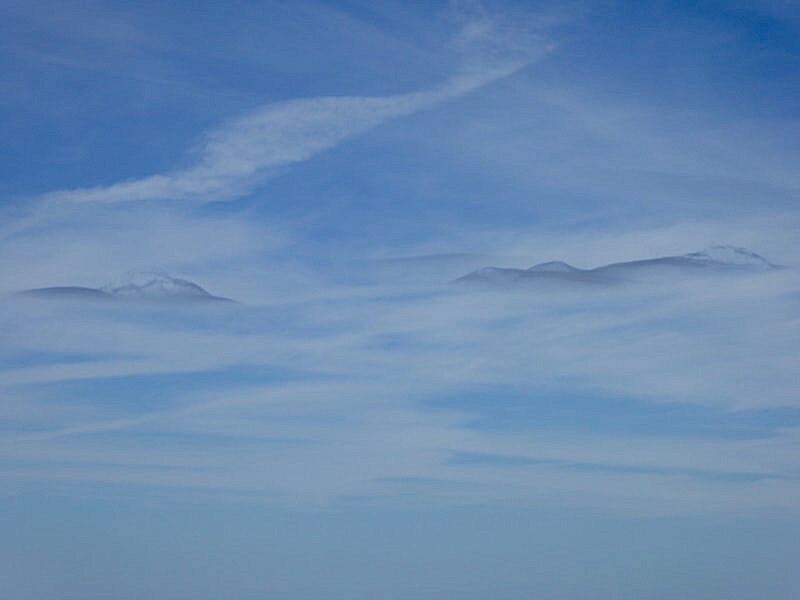 A very intriguing atmospheric phenomenon forming some very ethereal cloud mountains. 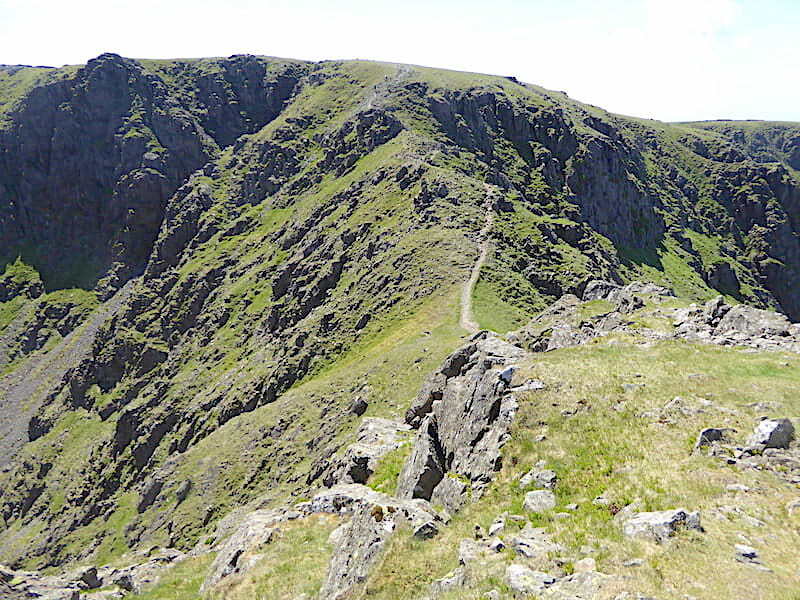 Back to earth for another look at Pillar and Black Crag from Steeple’s lofty summit top before we take our leave of our rocky perch. 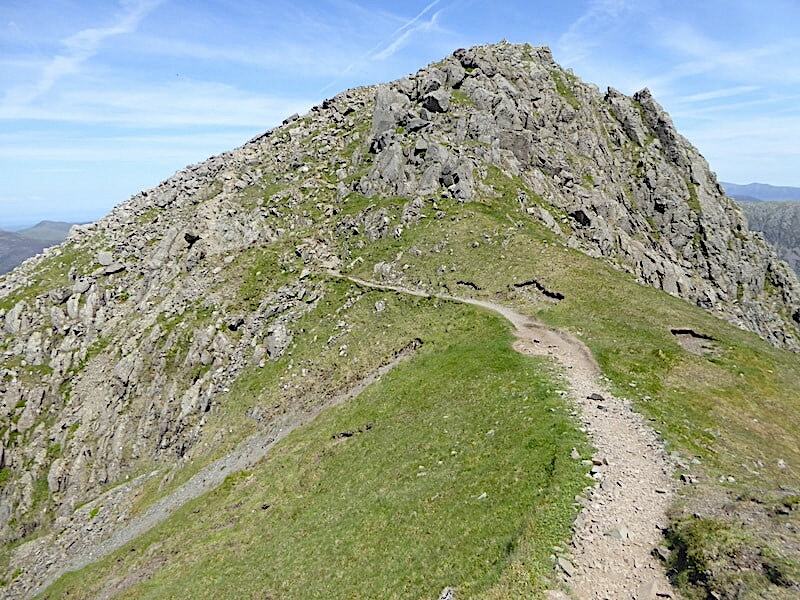 Its time to be thinking about having something to eat but we won’t do it on the summit of Steeple. 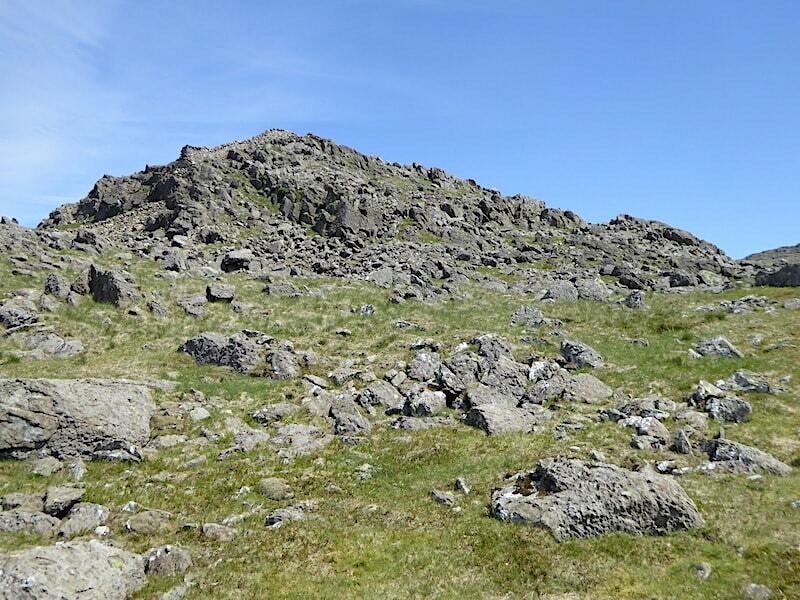 There isn’t a huge amount of space and we can see plenty of people coming across from Scoat Fell so it would be very selfish of us to hog the summit area and deprive others of the chance to enjoy their summit time as much as we’ve enjoyed ours. 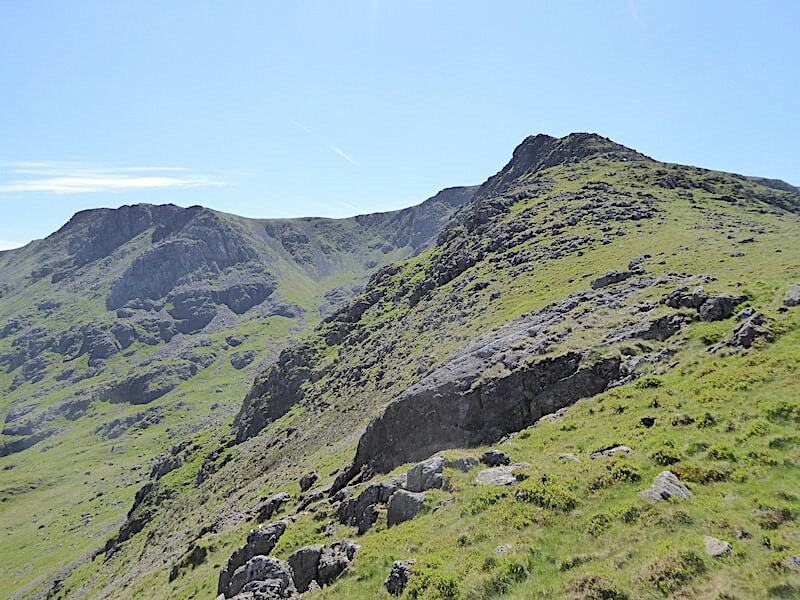 As we cross the narrow path across the arete I take a look back at Steeple. 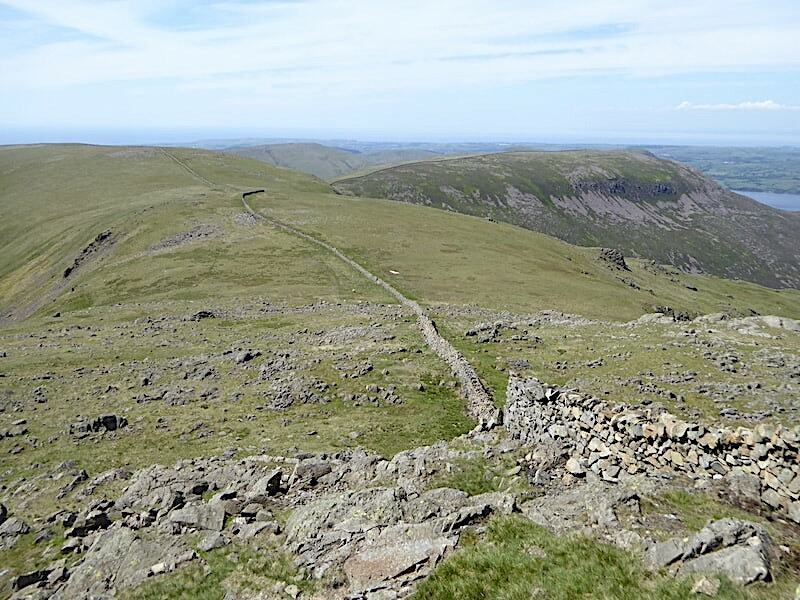 As you look at the shot the path descends from the cairn for a few paces down the left hand, or west side, and then swings around across a loose stony slope towards this short col from where the path follows a zig-zag course up the slopes of Scoat Fell. 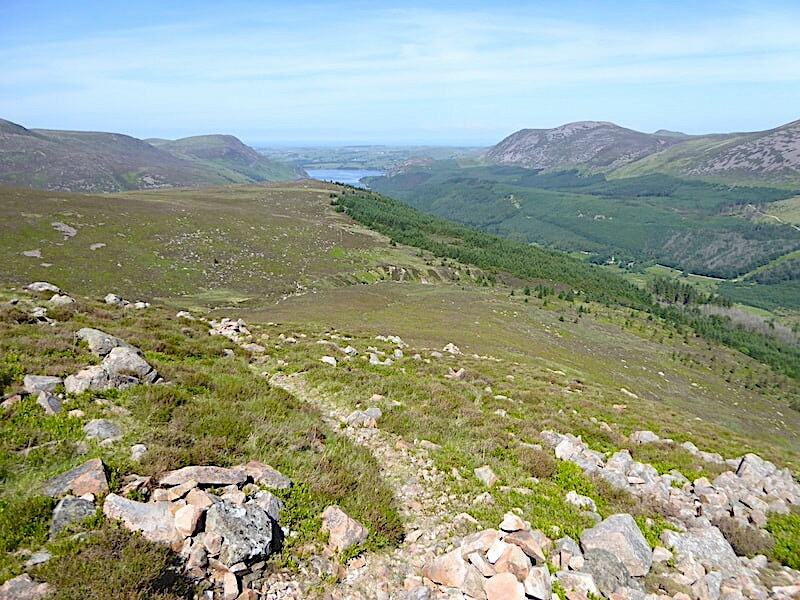 At the end of the col and just before we start climbing again I took a look down across Mirkiln Cove and the Tewit How ridge for this view of Ennerdale Water. 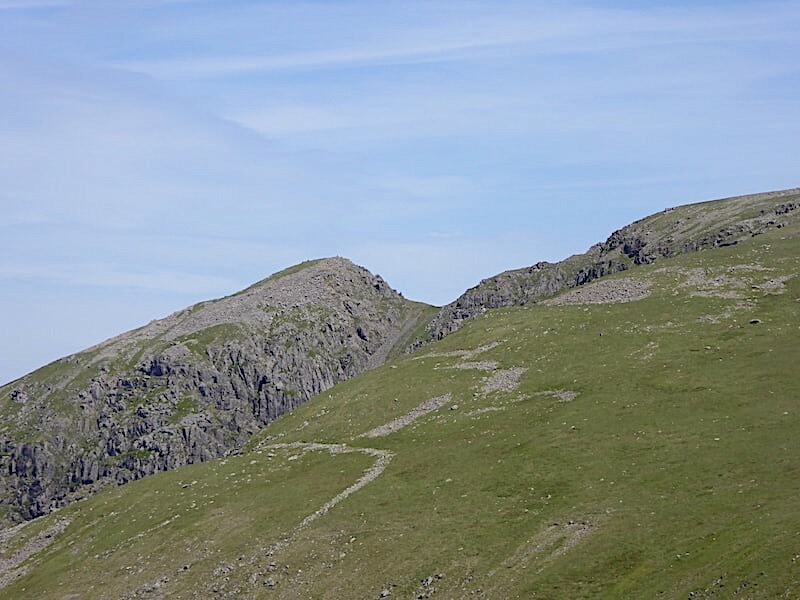 A view of the arete between Steeple and Scoat Fell from near the top of the path. 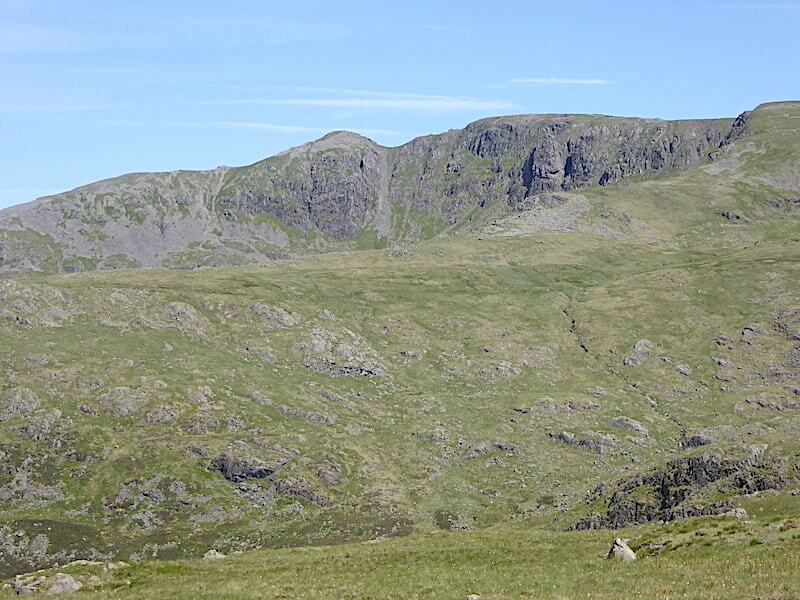 A final look across to Black Crag and Pillar as we reach the end of the crossing. 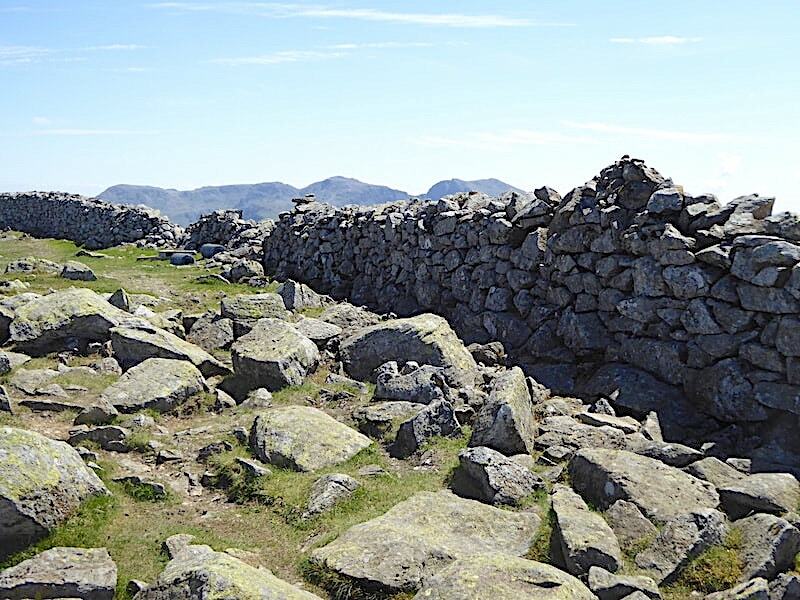 Once on the grassy top of Scoat Fell we turn left and follow the wall to …..
….. the summit of Scoat Fell, or as near as its possible to get given that the cairn marking the summit sits atop the wall. 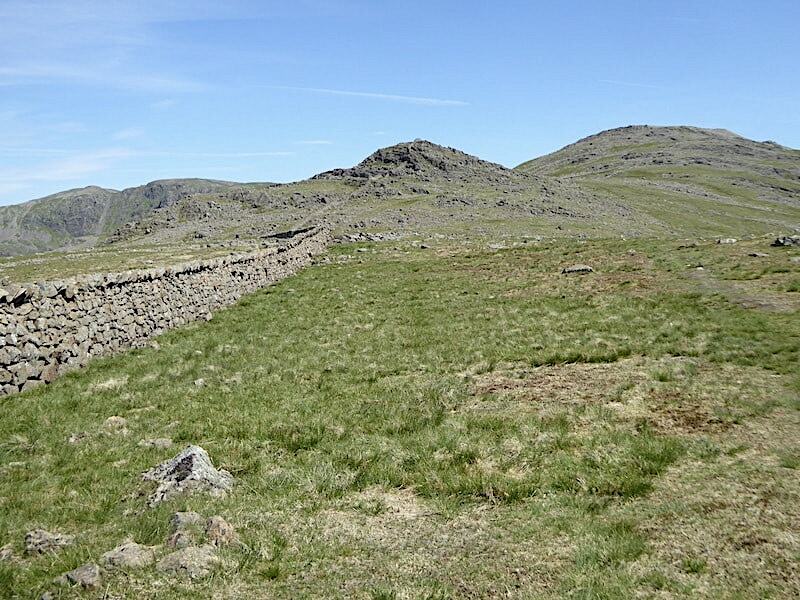 We cross the wall at one of the collapsed points and begin the hunt for a suitable spot for a break. As with many other rocky tops you are spoilt for choice but we eventually find that ‘just perfect’ stone/rock/boulder and settle down to have something to eat. Its still only a quarter to one but breakfast was a long time ago so we tuck in enthusiastically. 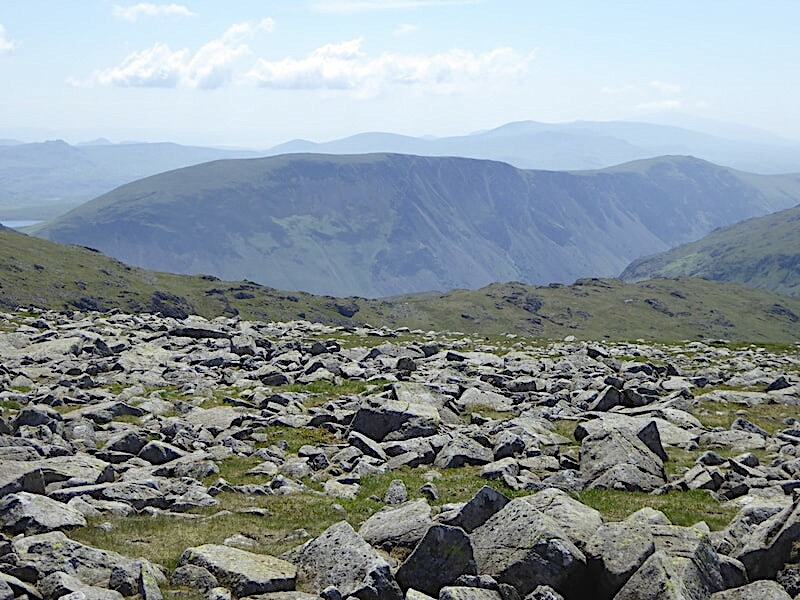 Once the stomach rumbles were silenced I took a few close up shots of the surrounding fells. 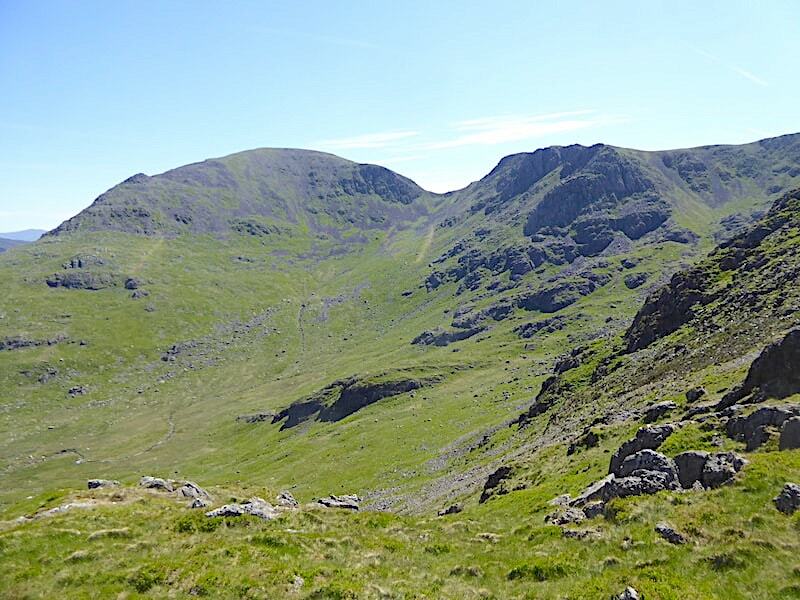 This one looking across to Scafell Pike and Scafell, with the green slopes of Red Pike over on the right. 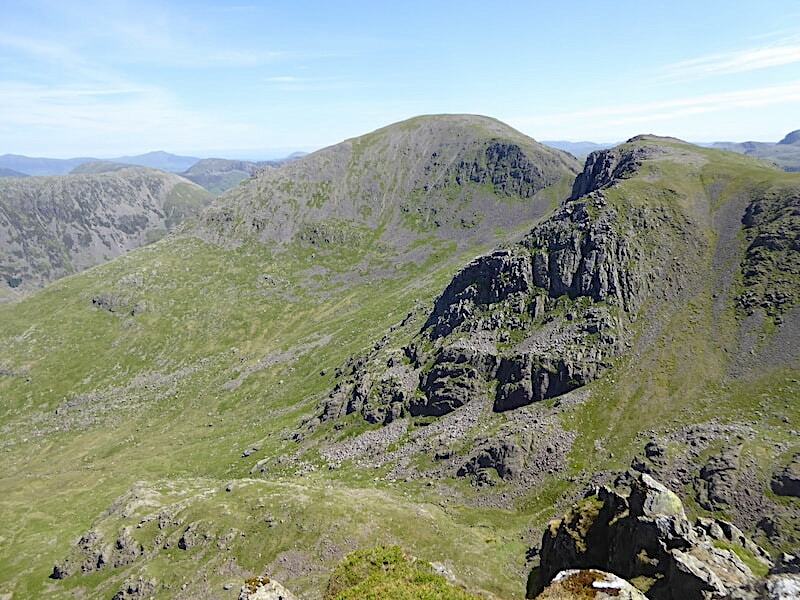 Great Gable beyond the flattish summit area of Kirk Fell. 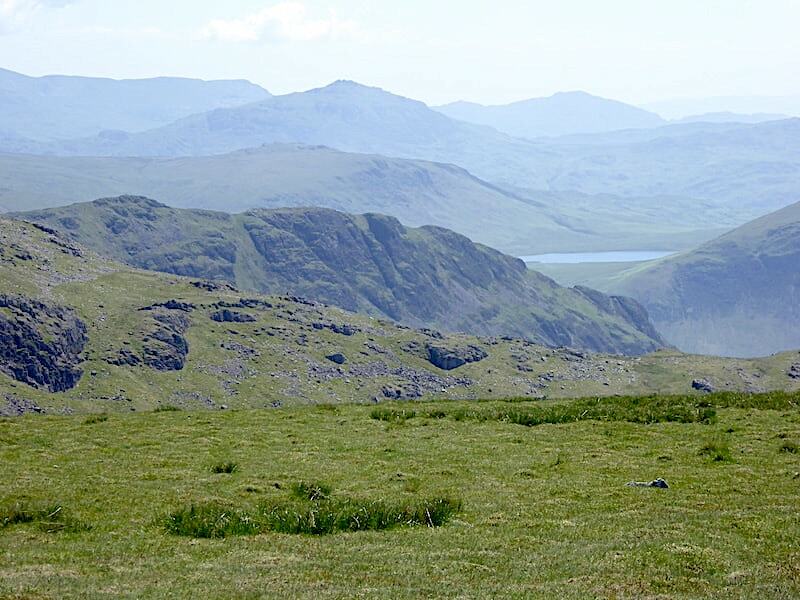 Illgill Head and Whin Rigg across the middle foreground. Middle Fell and Seatallan and the sands of the Ravenglass estuary catching the sunlight beyond them. 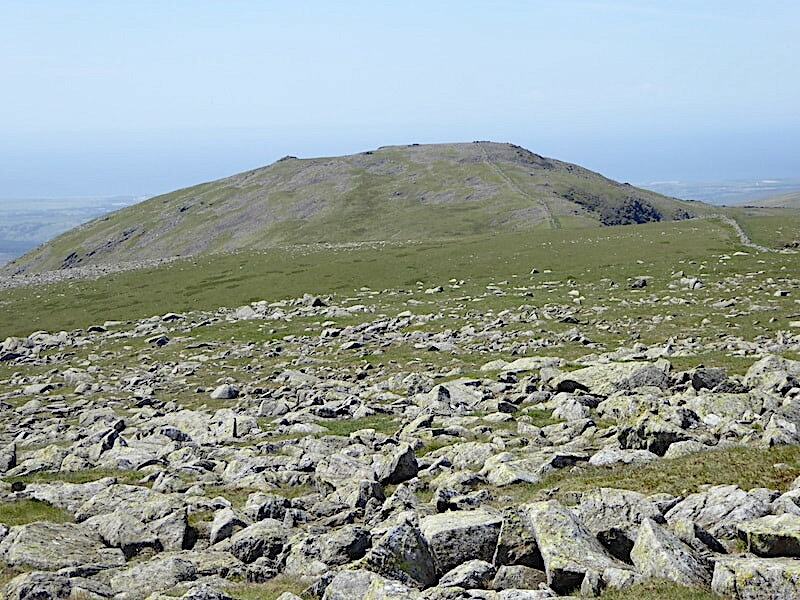 Finally, a look towards Haycock, the next fell we will visit today. We had a very relaxing lunch/rest break for just under half an hour during which a good number of walkers, arriving from all directions, passed by on the other side of the wall, every one red in the face and sporting a variety of hat styles. Feeling a whole lot fresher after food, drinks and a rest we hoist our packs once again and set off towards Haycock. 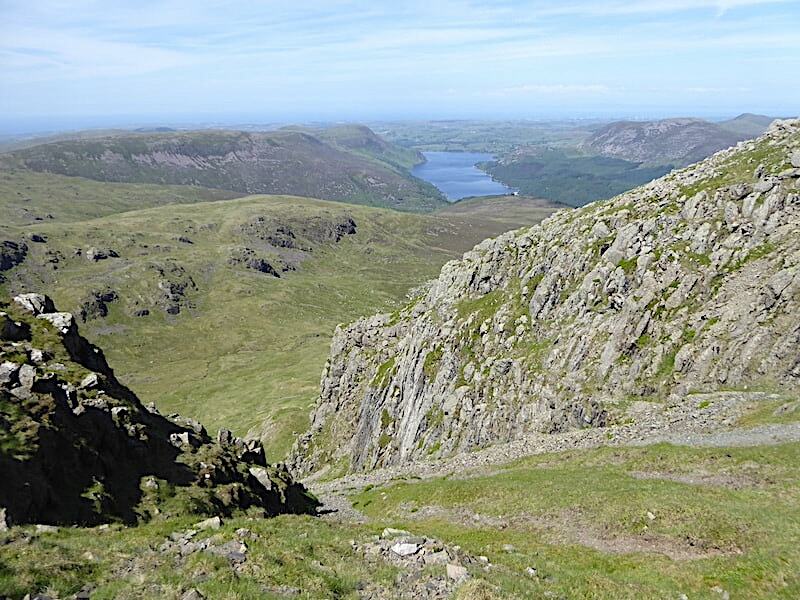 The deep clefts and fissures of Yewbarrow’s western slopes are on show as we drop down Scoat Fell’s grassy slopes …..
….. and walk the mile or so across to Haycock where an ascent of 330′ awaits us and the two walkers taking the same route a good distance ahead of us. No route finding problems as its just a matter of following the wall. 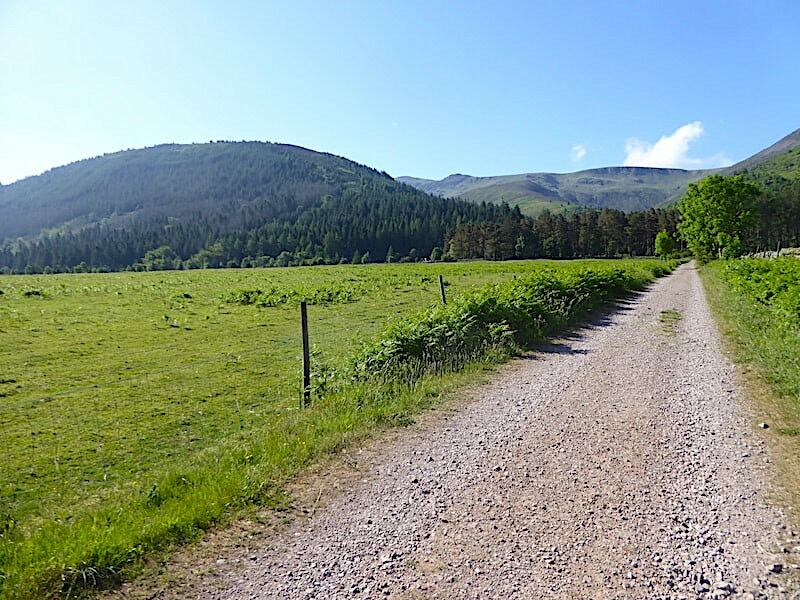 Little Gowder Crag is on the right of the shot. Taking a breather, and a look back at Steeple and Scoat Fell, from a little way up Haycock. As we reached the saddle below we met a young lady, still visible in a red top if you zoom in, who asked us for clarification as to which was Scoat Fell and which was Haycock. Apparently she had asked one of the walkers ahead of us and had been told that the fell we are now standing on was Scoat Fell and the one opposite was Haycock, but when she looked at her map she could see that information she had been given didn’t match up hence her confusion. We’ve all had times like that, its hot, you’re tired and your brain can’t see the wood for the trees, as the saying goes. She wanted to go up Scoat Fell and then on to Pillar so we pointed out the right direction and she settled down to wait for her pal who was slowly making her way up the path going off to the right of the shot. 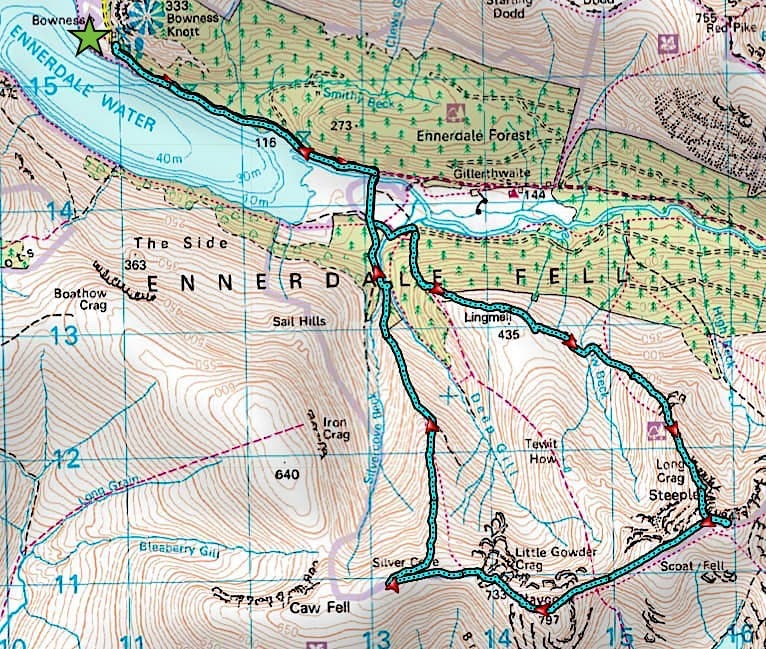 That’s a route coming up from Wast Water so they’ve already had a long walk with quite a bit more to do. 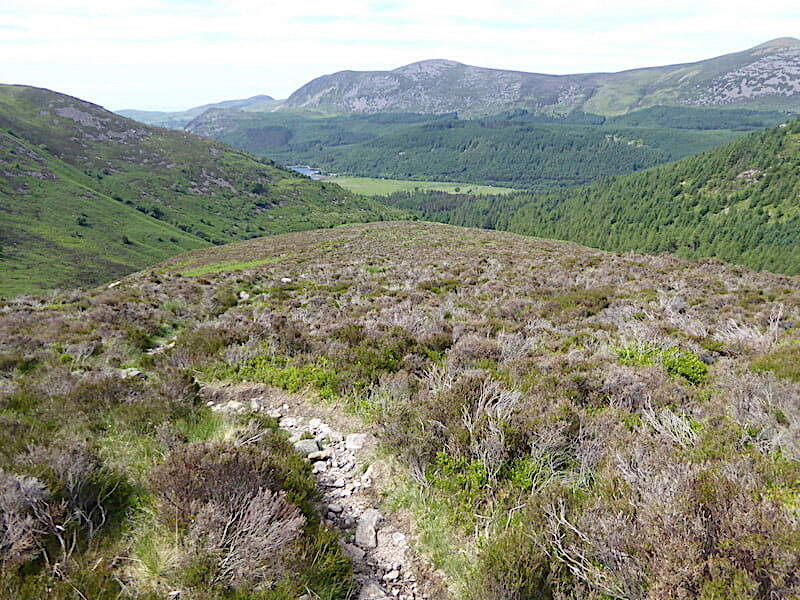 The path going down to the left of the saddle returns to Ennerdale via Tewit How. We carry on up Haycock with a look around every now and again, here for a closer look back to Steeple and the arete to Scoat Fell. 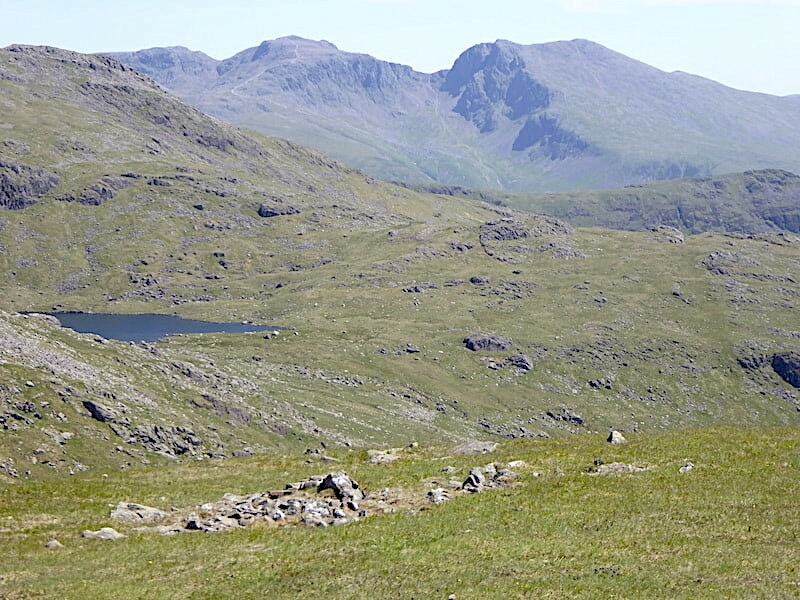 The majestic Scafells once again, and just a fraction of Scoat Tarn on view below the slopes of Red Pike. 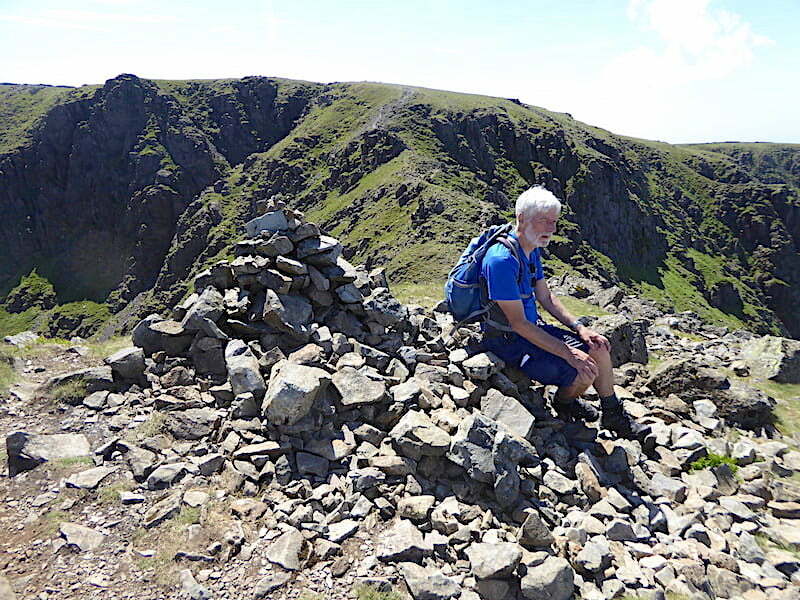 Almost at the top now so time for another look back before the view disappears …..
….. and then up onto the summit where J finds a ‘just right for a sit down’ boulder …..
….. and I do just the same. The green notice offered some waffly jargon and worthy phrases which filled the sheet but delivered nothing specific, leaving us none the wiser about what it was meant to convey. Its ten minutes shy of two o’clock and still very hot but the breeze stays with us and keeps things comfortable. We take some more liquid on board and then get on our way again …..
….. across the boulder field and over to …..
….. Little Gowder Crag, which we decide to cross over rather than go round it. Its not much of a clamber and the top is soon reached from where we take a look back at Haycock. You can’t help but be impressed by the wall builder’s determination to let nothing stand in the way of his wall, it was going to be built across here no matter what. 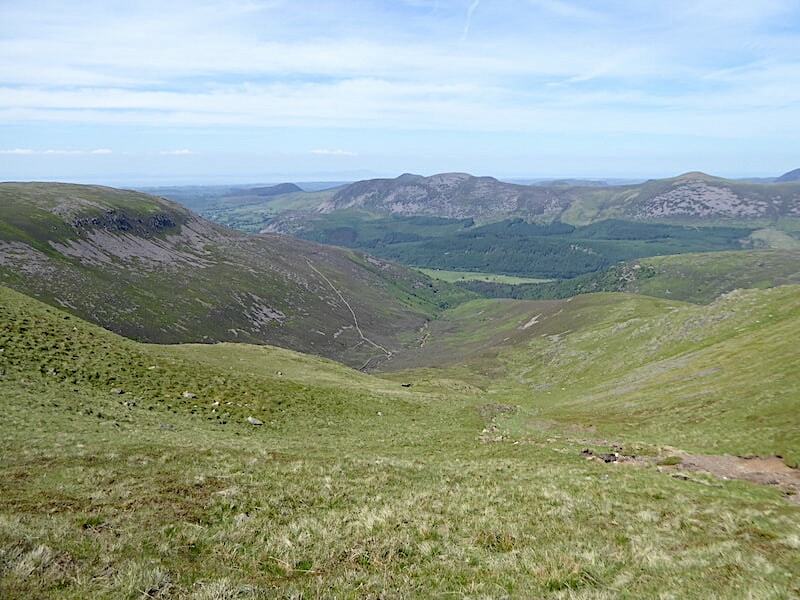 A fine view of Seatallan across Blengdale from Little Gowder Crag. 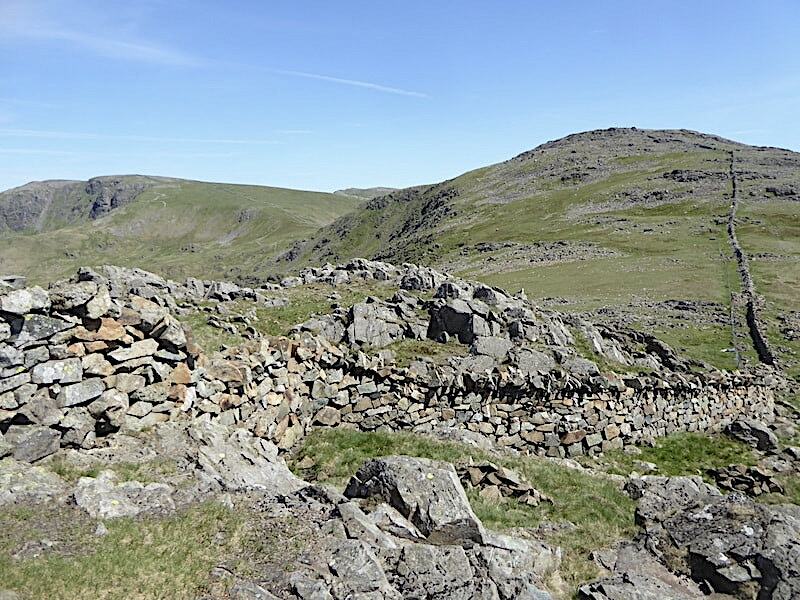 We didn’t follow the wall closely as we descended Little Gowder Crag because it leads to something akin to a cliff edge …..
….. as can be seen from this look back at it, even the determined wall builder had to yield to the inevitable in a couple of places. It was a simple matter to sidestep the awkward drops and just skirt around them instead. Off Little Gowder Crag now and back on a firmer footing so another look back at the fells we’ve crossed today. 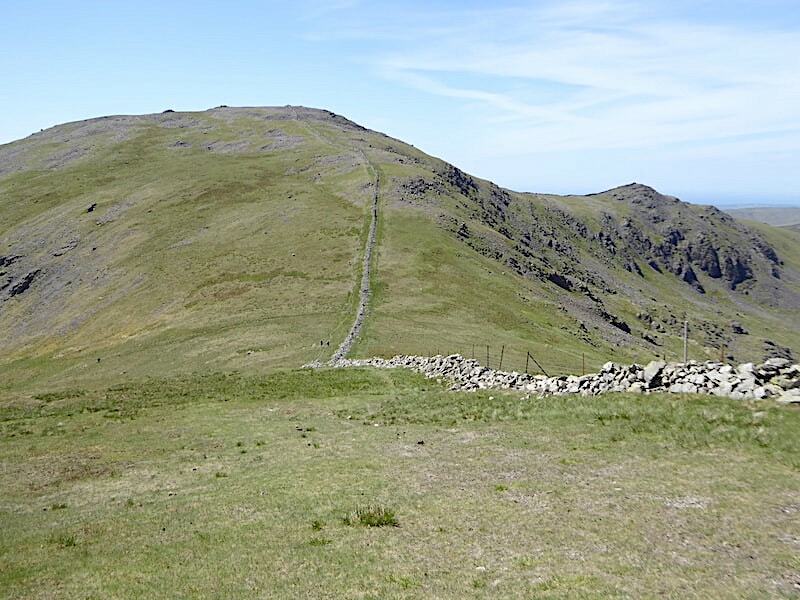 There’s still one to go though …..
….. so off we go across the lovely springy turf towards Caw Fell. 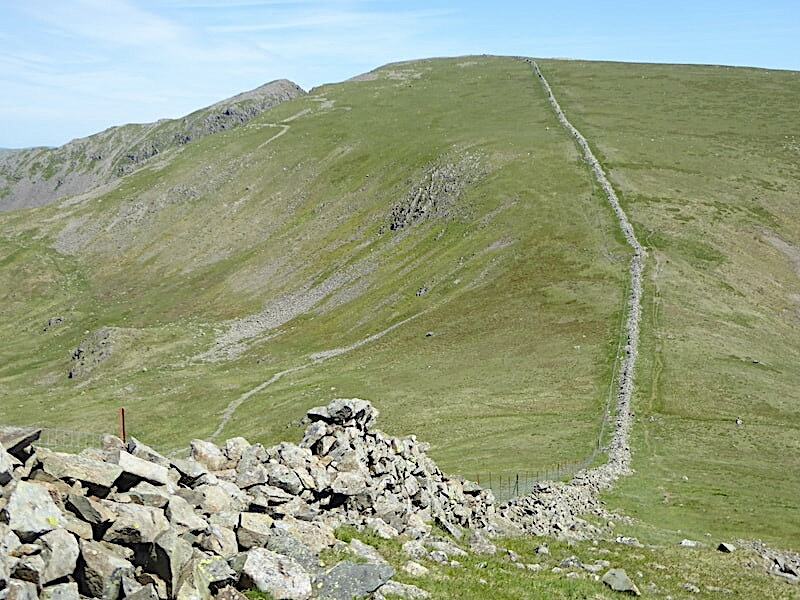 I suppose the springy turf and the long wall are just about the only things going for Caw, plus the added bonus of a very gentle climb to the top. Apart from that there’s not a lot else which is worthy of mention. AW just about summed it up when he wrote ‘The scenery deteriorates with every step.’ Despite that he also wrote ‘Yet here one can stride out for hour after hour in undisturbed solitude’ and that suits us down to the ground at the moment, a time for us to relax and enjoy the effortless tramp across before returning to Ennerdale on rough paths through another tangle of heather and bilberry. Another boulder strewn summit area although the cairn didn’t seem to be sited at the highest point, not that we cared because we aren’t that fussy about standing on the very topmost inch of any fell. 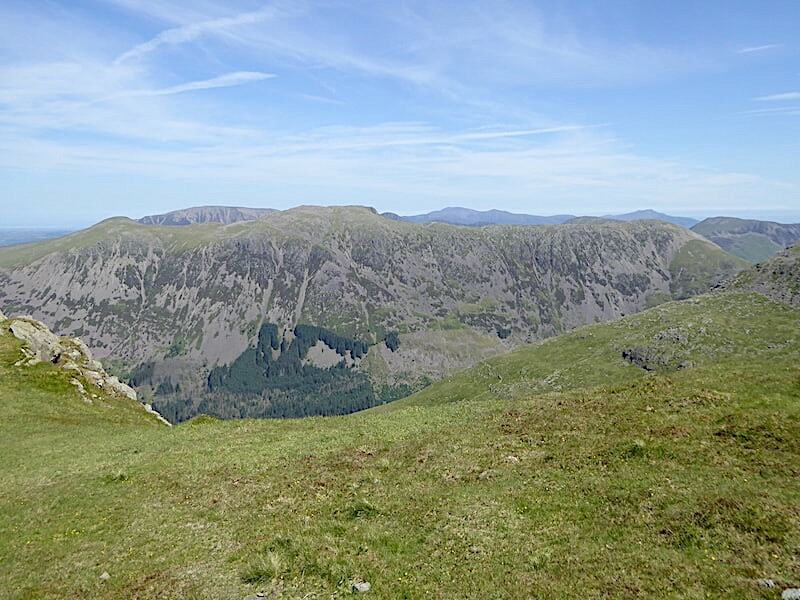 A quick shot of Grasmoor and the High Stile ridge and then off we go to begin the descent down into Ennerdale. 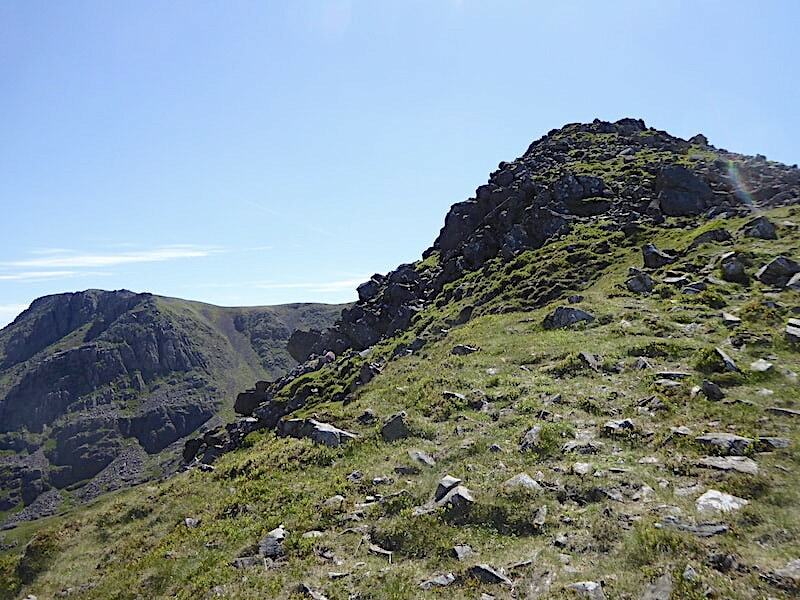 We head over towards the Silver Cove ridge and pick up this little path which runs below the ridge to begin with before joining the main path further down. The gentle nature of Silver Cove looked very appealing after all the rugged mountain scenery we’ve been accustomed to for the past few hours. There was plenty of time to view the various aspects of the fells we’ve crossed today. The rocky towers of Steeple, in the centre, are smoothed out and almost indiscernible while the eye is drawn to its massive rock buttress overlooking Mirkiln Cove. 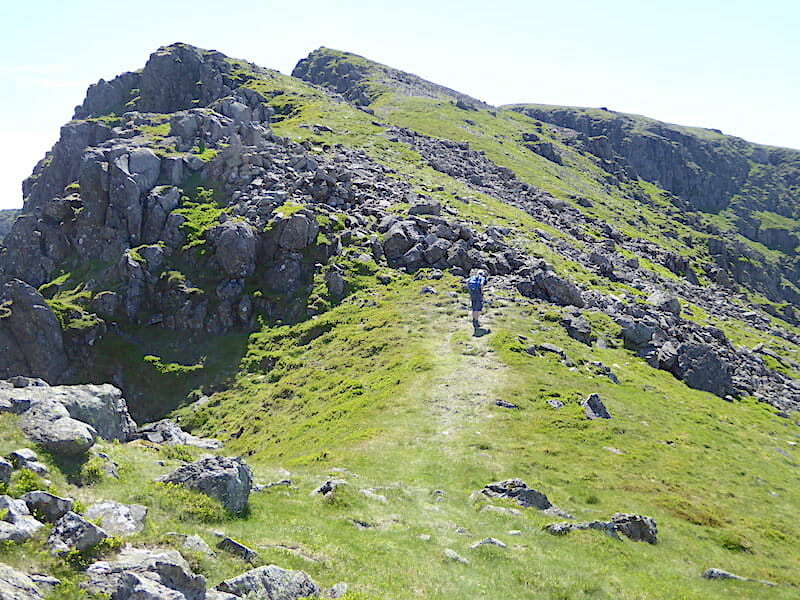 Scoat Fell too has its own named feature, that of Haskett Buttress, at the head of the cove. Between us and the Tewit How ridge is Great Cove at the head of which stand Haycock and Little Gowder Crag, the pair of them creating a formidable defensive barrier. 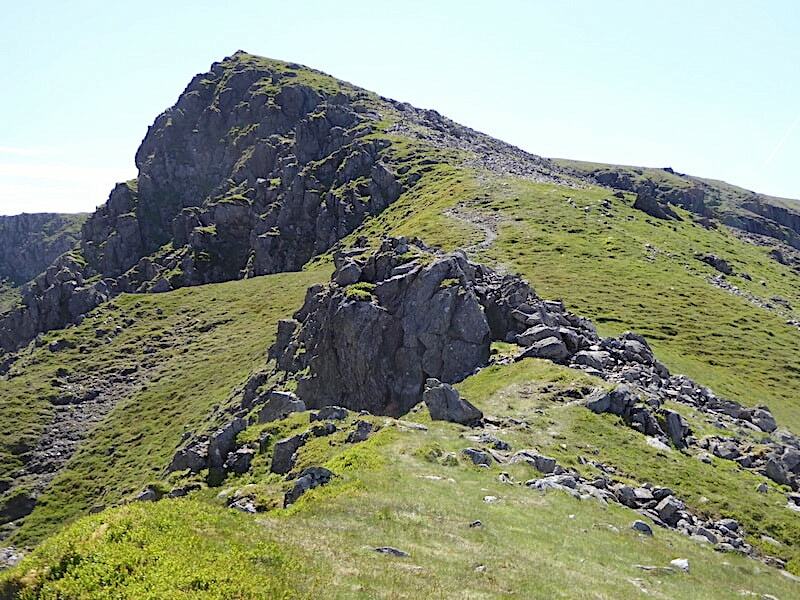 We eventually meet up with the path heading down the Silver Beck ridge so its goodbye to springy turf and hello to rough and rocky once again. Let’s adopt a positive outlook, the heather isn’t so thick at the moment that the path is obscured, and there isn’t a midge to be seen anywhere. Its not all plain sailing though because, in a few places further down, the path has been worn into knee deep groves which have been overgrown by heather making them difficult to spot. 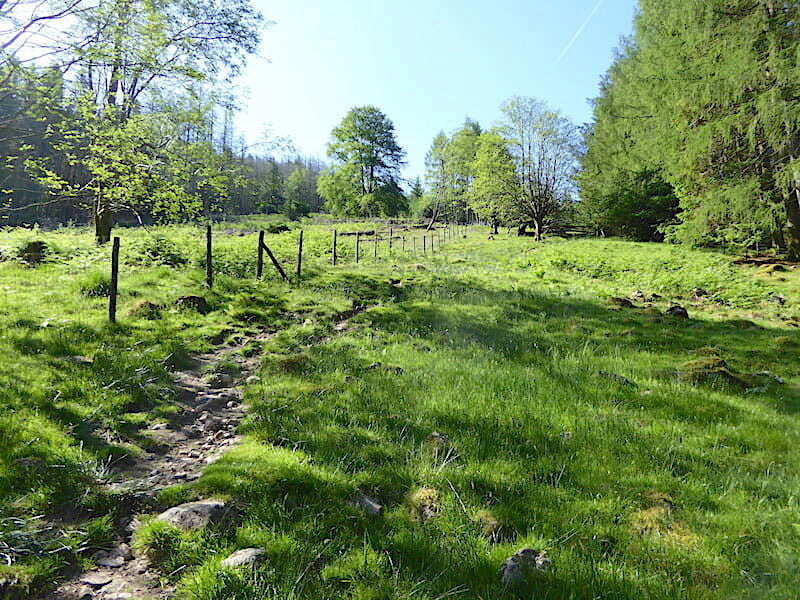 The rough, heathery patches finally come to an end at this step stile and the path then meanders through the shady trees and shrubs of Tongue End. Almost back down to valley level and to the point where, just above the confluence of Deep Gill and Silvercove Beck, the path splits. 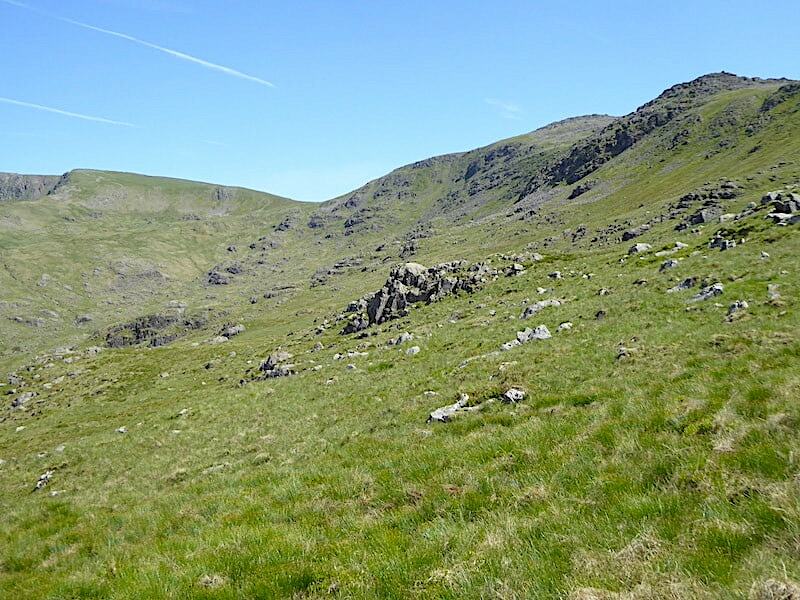 This is the right hand path across Deep Gill where we stopped to refill the water bottles. We still had plenty left but it was very warm by now and the prospect of glugging down some cold beck water was irresistible. We didn’t cross here but the water was more accessible here than it was in Silvercove Beck. Bottles filled and thirsts slaked we retraced the couple of steps back to the junction and took the left hand crossing instead. 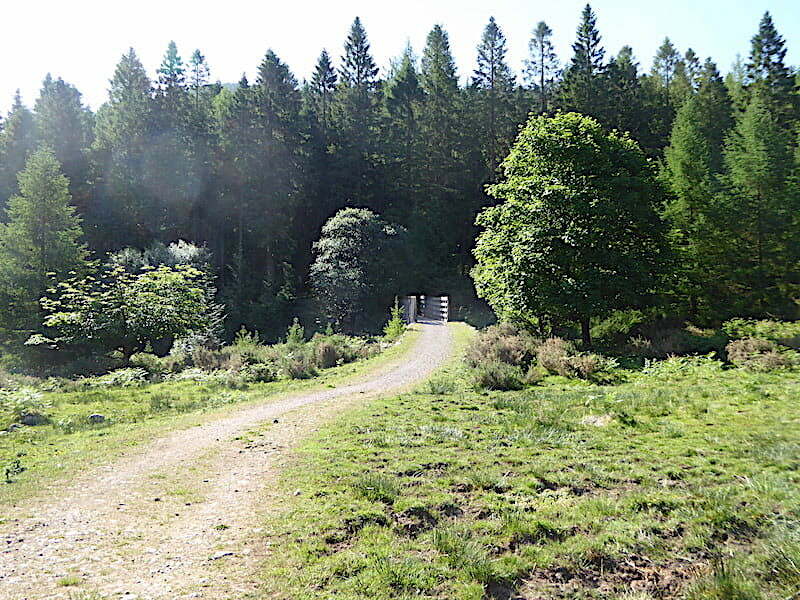 Beyond the bridge there’s a short climb up a watery banking and after that the path tracks gently through the conifers and brings us out at …..
….. this wide path through the conifers at the end of which we are back at the same junction where we turned off to the left this morning. 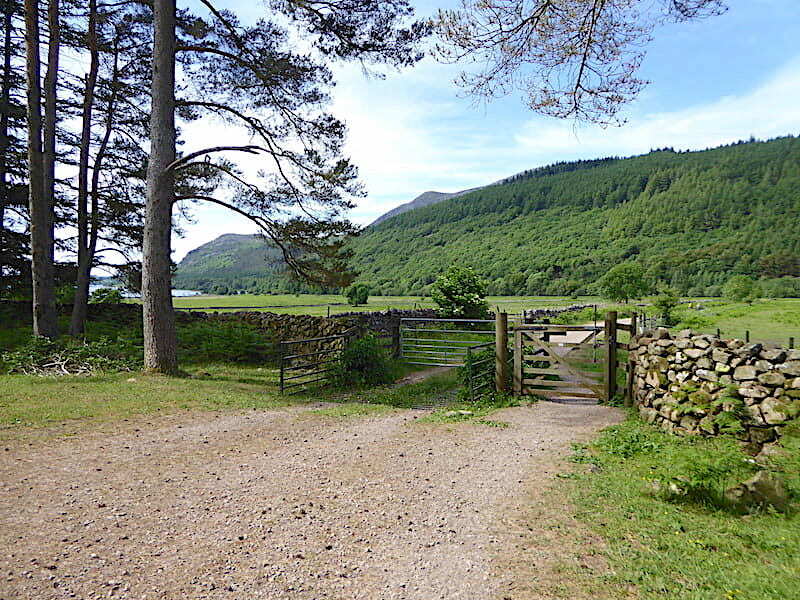 From here on its just a matter of reversing the route we followed this morning so we go through the gate and onto the lane …..
….. with a look along Ennerdale as we head towards Irish Bridge once more. From the bridge there’s a longish walk back to the car park, which for us took about thirty minutes at a steady pace. 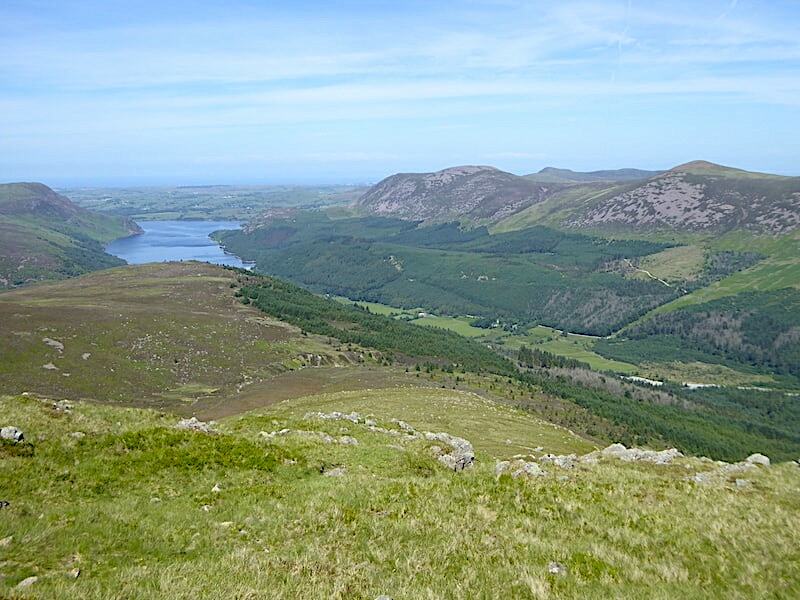 From one of the little bays along the shoreline we take a look back at the Ennerdale skyline where four of the tops we have walked today are still bathed in sunshine. 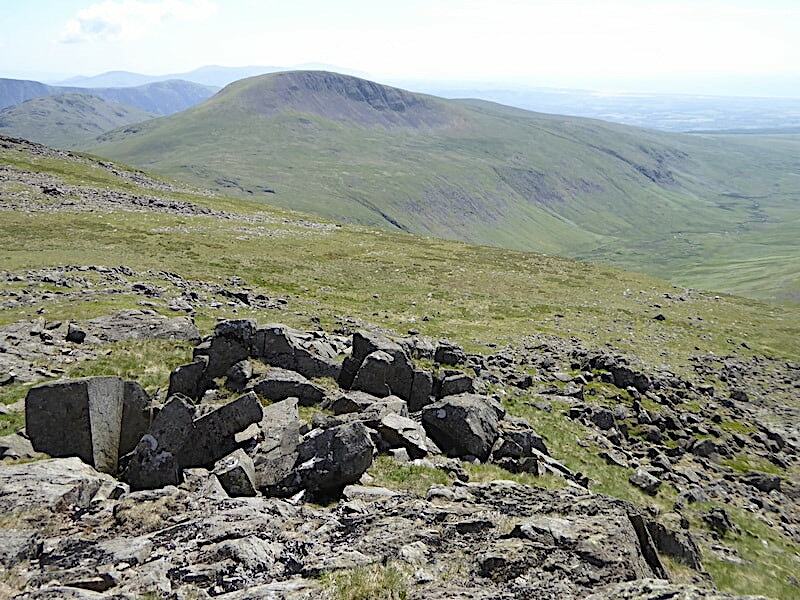 Only Caw Fell is out of sight, hidden behind the slopes of Iron Fell on the right of the shot. So today’s walk is almost at an end, and a grand one it has been. 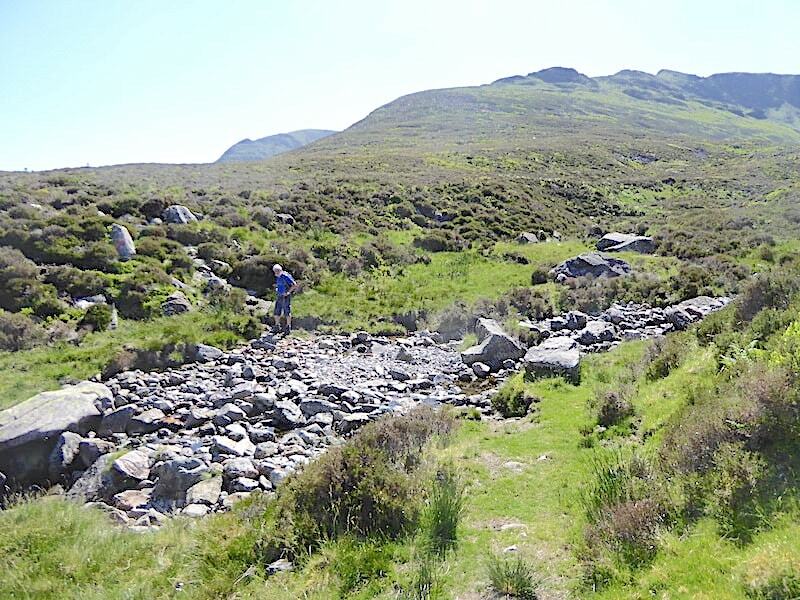 Yes, It was long, hot and tiring but with an abundance of fine scenery and plenty of interest it was well worth the effort, makes you wonder why we’ve overlooked it for so long.